When this Aurora woman called SOS she was at her wits end with her master closet. The funky shape made it difficult to use and access nearly a quarter of the space. Never fear…SOS to the rescue. 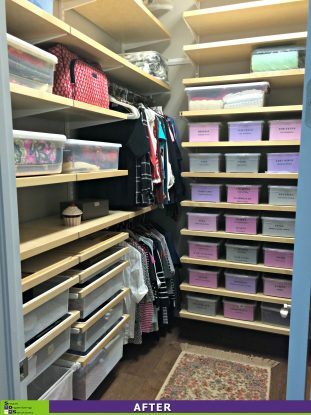 We used elfa from The Container Store and re-designed the space to make everything easy to see, get to and keep organized. 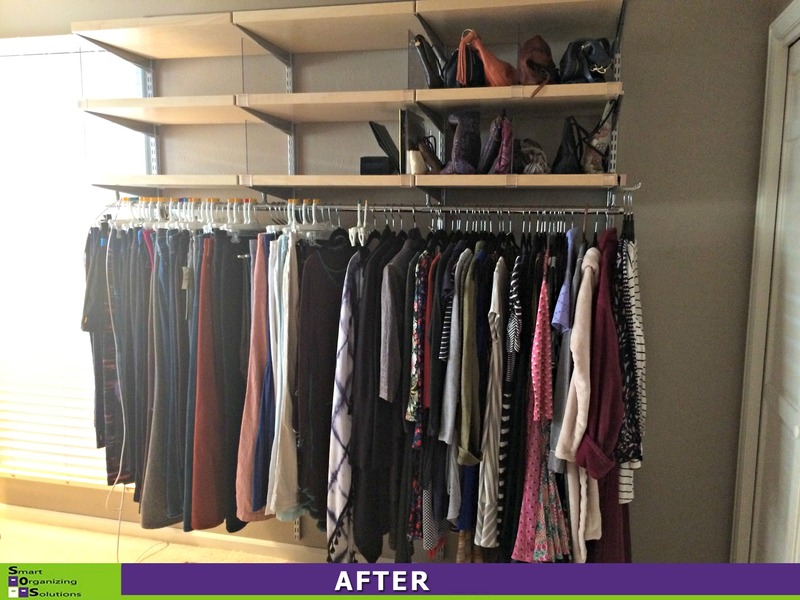 When this Denver couple decided to renovate their new condo, they called SOS to design all of their closets. I had the most fun working on their master since it was truly a blank slate. 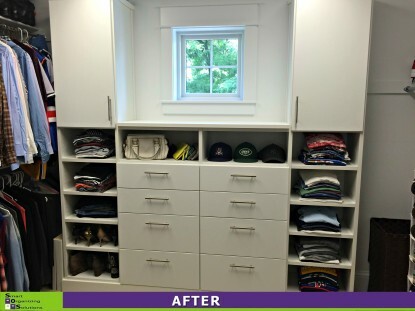 There were a few funky angles to work around, but the end result is a closet that meets their needs and looks beautiful! 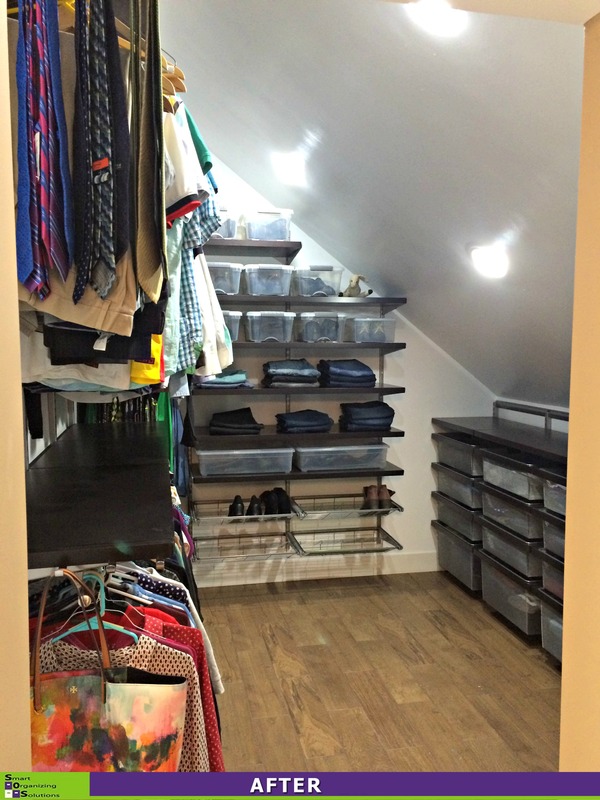 This Denver couple needed help making sense of their quirky closet with its low ceiling and angled roof lines. SOS stepped in to help them put it to better use. We decided against having a his and her side. 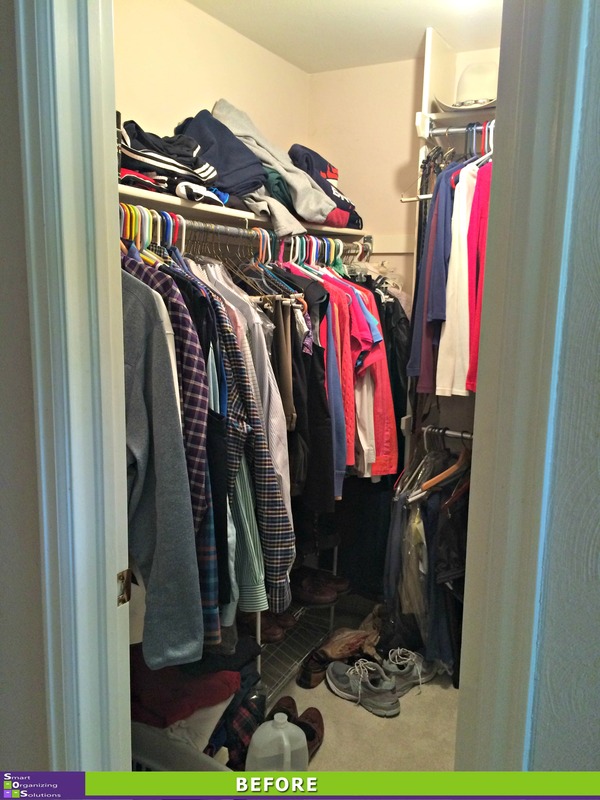 He’s tall which means his clothes are longer and the double hanging section on one wall just wasn’t tall enough – his clothes were dragging on the ground. So we made the upper section for his shirts and then made the bottom section for both of their pants and her skirts. 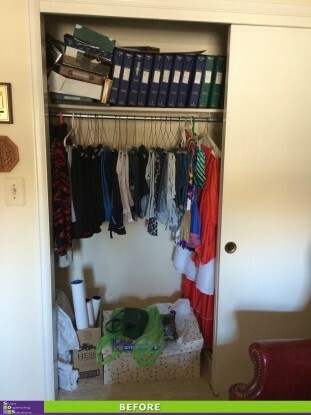 His suits and jackets now share space with her dresses in the long hang section. 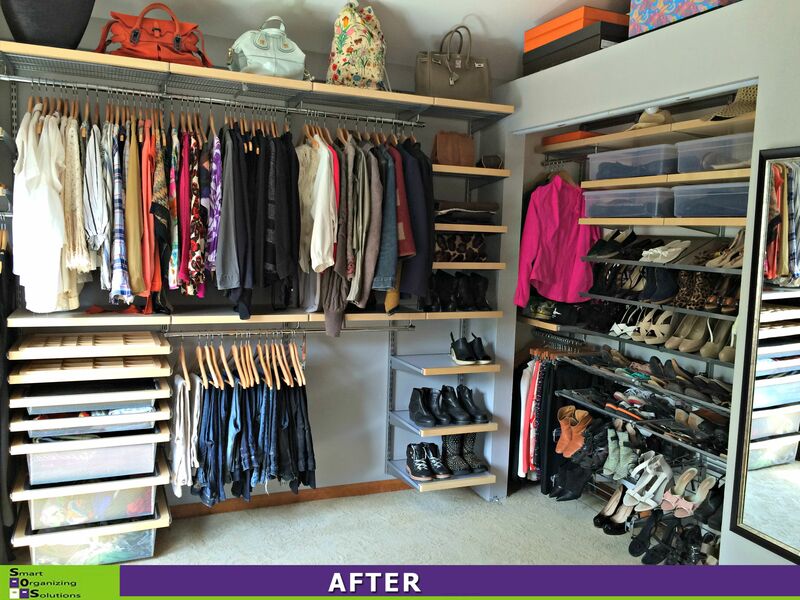 And we removed the completely useless hanging rod on the lower half of one wall to create a space for shoe racks. 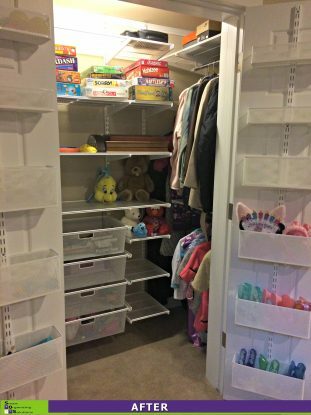 Some new folding techniques transformed all of the shelf cubbies and even left us with some empty space! 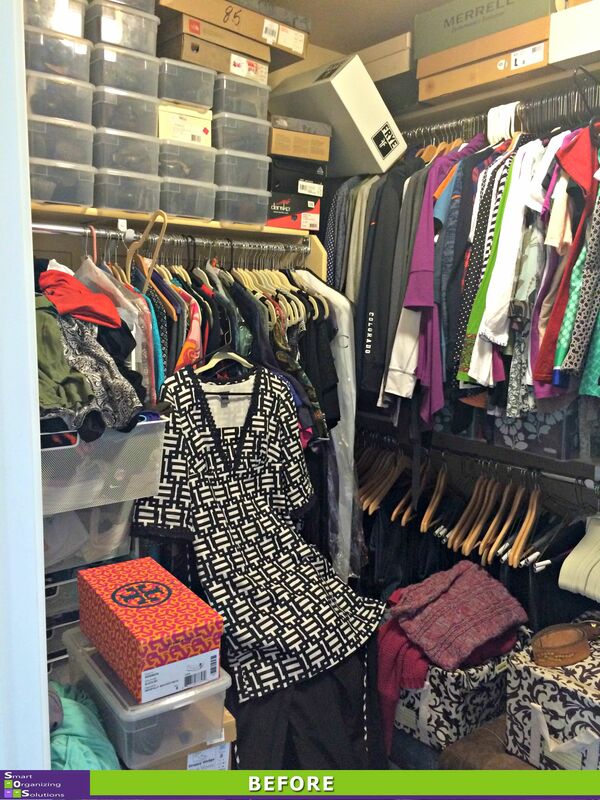 The best part…my client called what I did “closet wizardry.” I just love that! 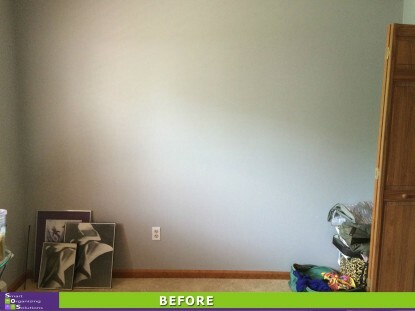 I had such a fun time working this client in Littleton. 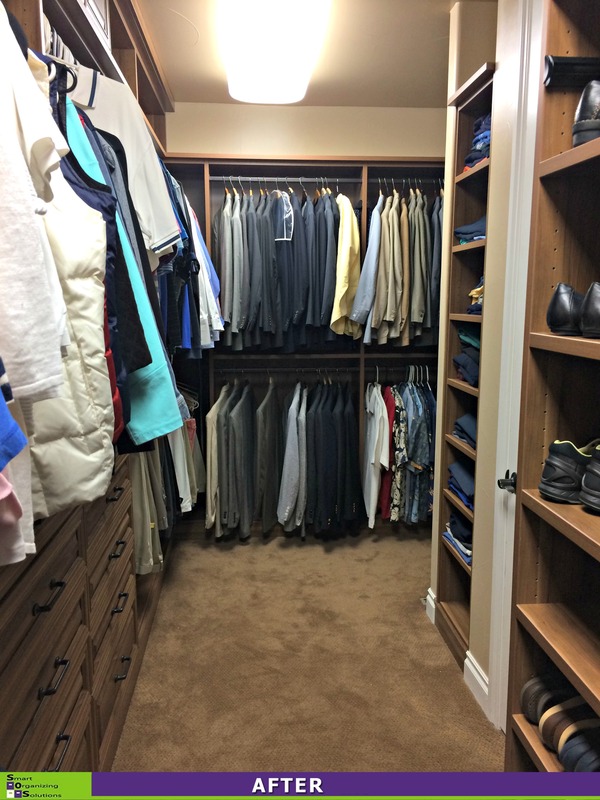 She recently moved into a large retirement community and needed help with her master closet. The way it was configured made opening the doors difficult and it was nearly impossible to access anything on the side walls. 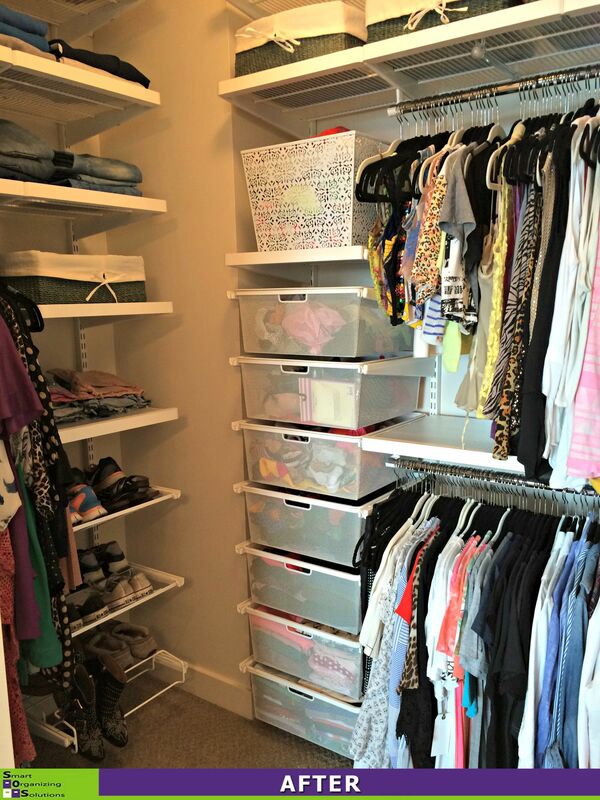 We turned to elfa from The Container Store to give her a smarter layout. 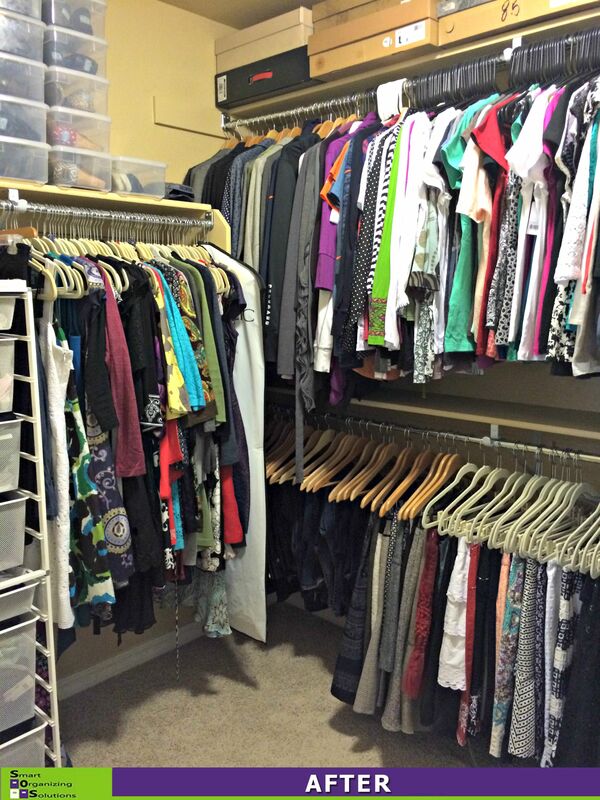 We created a small section of long hang and loads of short hang. We added pull out shoe shelves and shelves on the side walls for all of her folded clothing. Now she can see AND access everything. 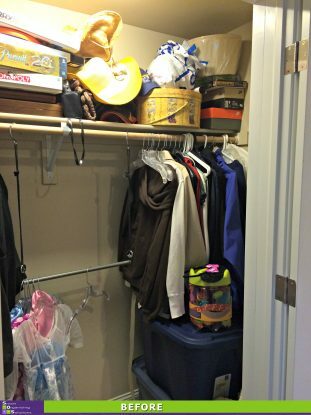 When you don’t have a basement or a garage, you need to maximize your one and only storage closet. 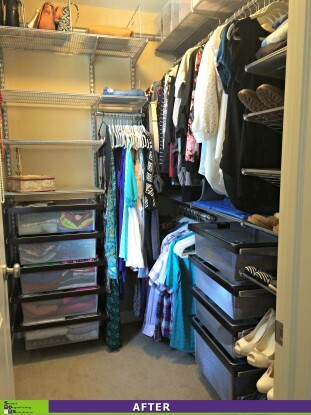 And that’s just what SOS did for this Highlands Ranch woman. 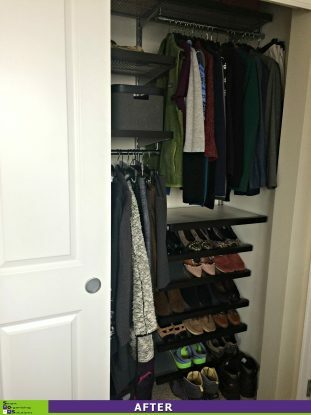 Since this closet would not be used for hanging clothes, we ditched the existing shelves and took advantage of all that wall space by adding adjustable shelves using elfa from The Container Store. We left room at the bottom to storage suitcases, a folding table and chairs, and a stand for TV trays. 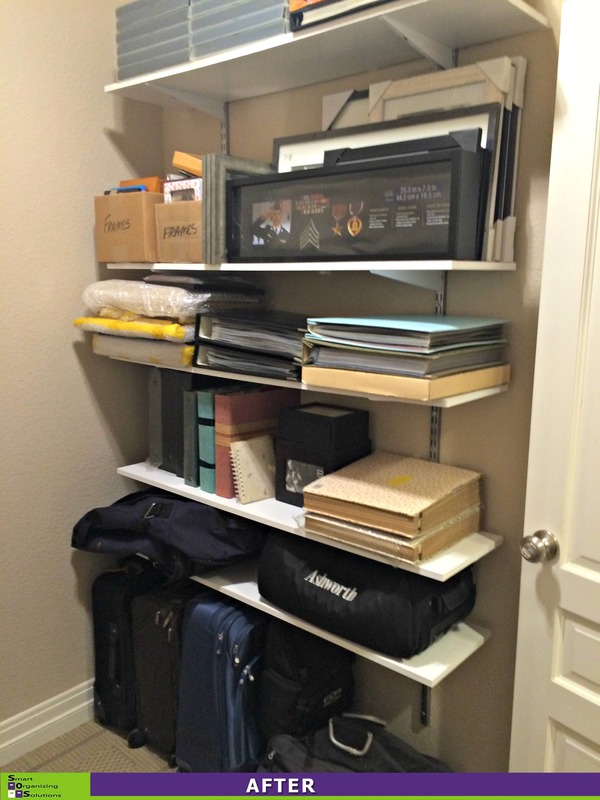 Completed scrapbooks now stand tall on the top shelf. 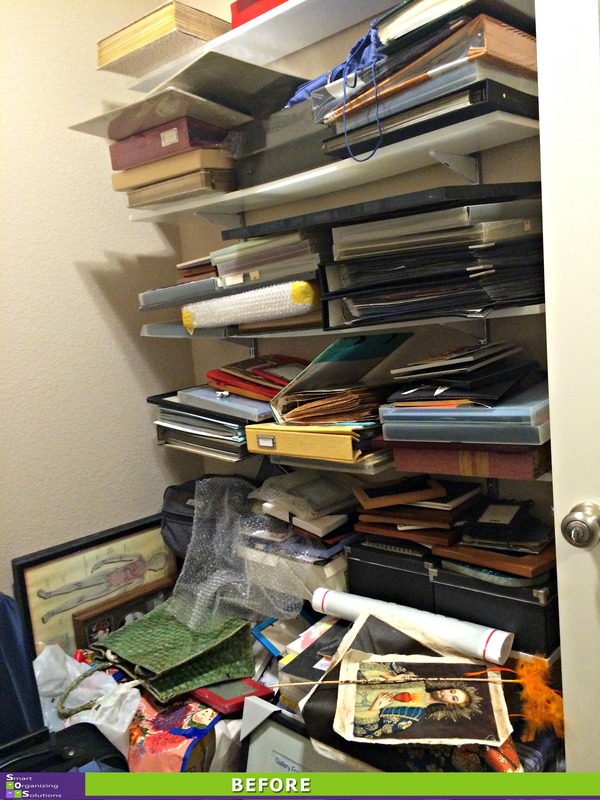 Boxes and bins of photos that need to be sorted and put into their own books sit on the shelf below. 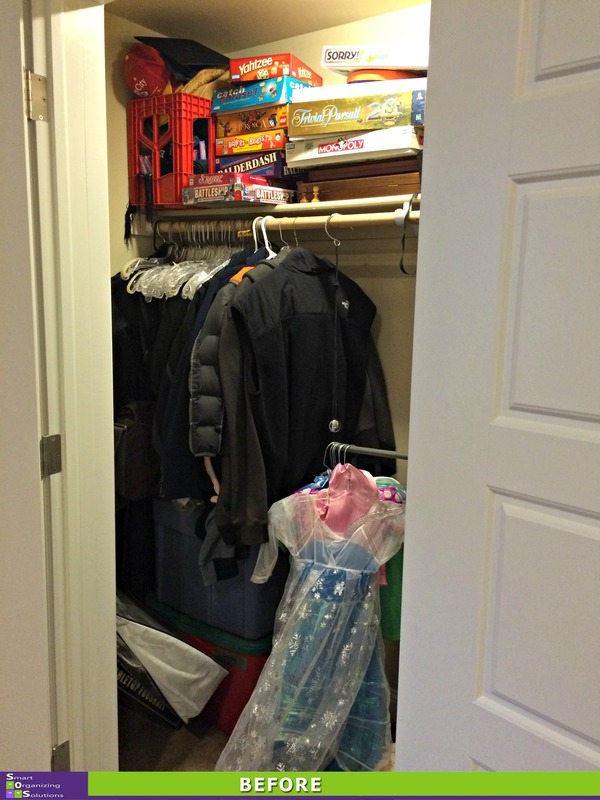 We created a space for holiday decorations, paperwork, guest room bedding and games for the grand kids. We even have some empty shelf space! This Denver homeowner wanted some advice and help with her master closet. While she did a small amount of purging, most everything that was in the closet, stayed. 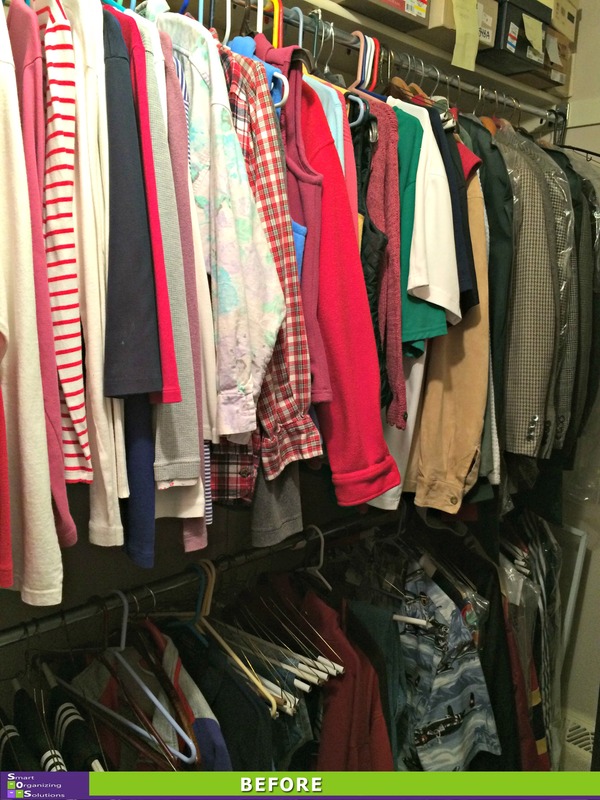 It didn’t take long to sort, fold and re-hang clothes to make everything easier to see. She said she already feels a sense of calm when she walks into the space. Mission accomplished! This Longmont woman has a small house with only one closet. Yes, one! And it really needed some attention from SOS! We dived in and sorted through clothes, shoes, purses, coats and general storage items. 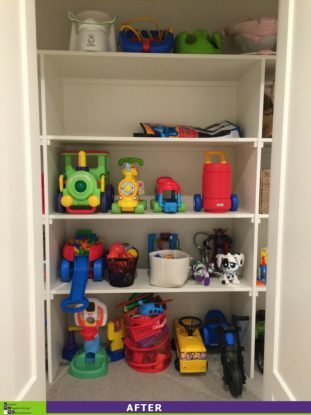 Some items were donated, some moved to other areas of the house. Once we were finished and had everything put back, we decided the space would benefit from a re-design. We turned to elfa from The Container Store. Since we had already done the organizing, it was easy to know just how to design the space. Now every inch is utilized and easy to access. When you downsize, not only do you let go of a lot of things before you move, you also have to re-think the way you use your space. When my client moved from a large home to a smaller condo, she knew everything she wears would not fit in her master closet. 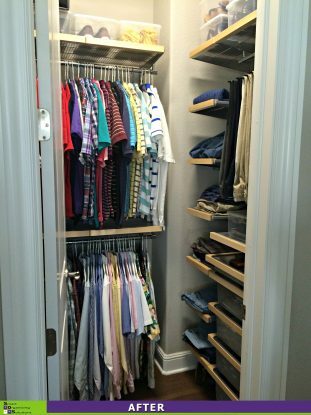 We came up with a plan to use the guest closet to store off-season clothing, linens and other miscellaneous items. We re-designed the space since it only had one shelf and rod for hanging. 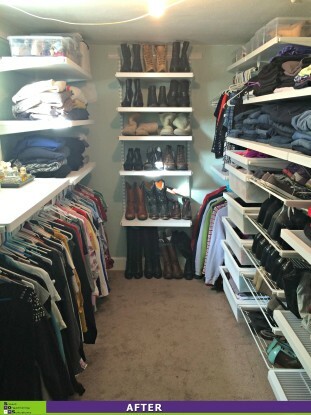 Now, there’s a great combination of hanging space, as well as shelves. 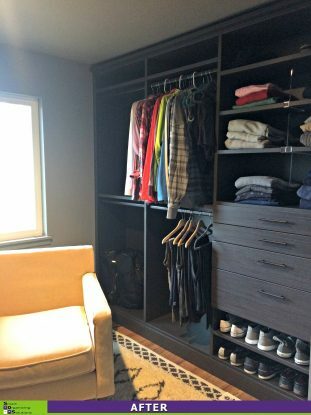 My client gets her off-season storage and there’s still plenty of space for guests to hang clothes and feel right at home. 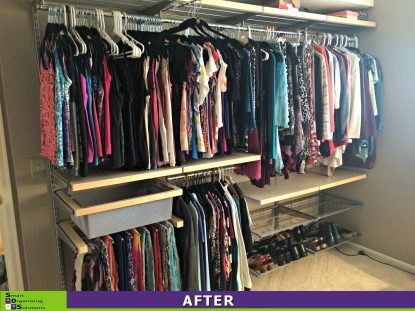 When this Denver woman moved from her large house to a smaller condo, she knew she needed to re-work her closets. Let’s face it, a single rod and shelf just won’t cut it in a master closet. 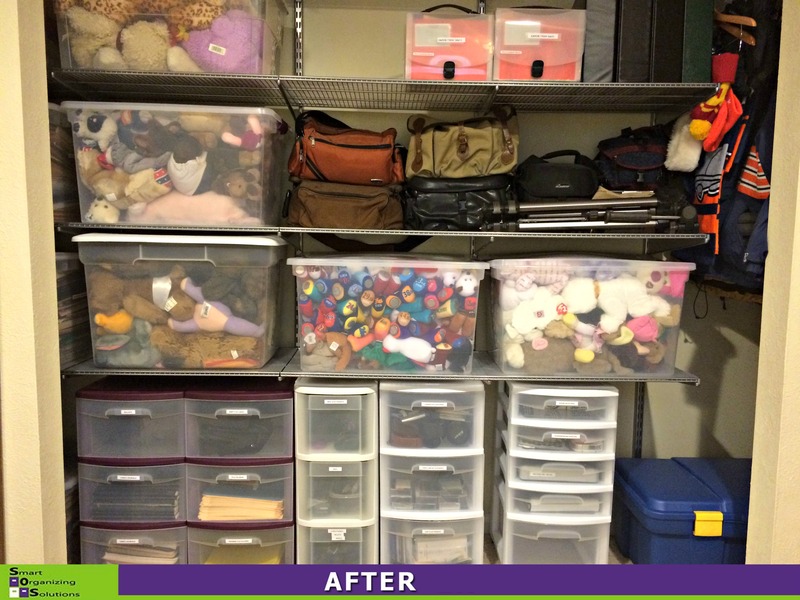 We turned to elfa from The Container Store to maximize storage and make everything easy to see. 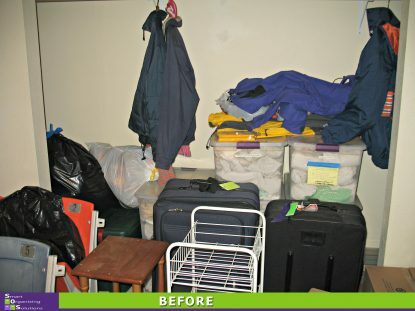 Once it was installed, SOS helped her unpack and organize! 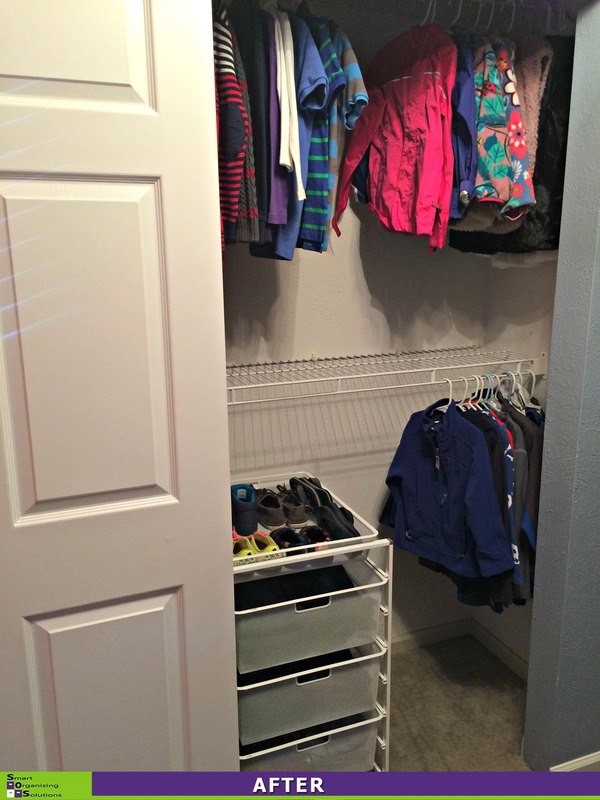 SOS adds loads of storage space to a small coat closet. We used the door to full advantage by adding an elfa door rack from The Container Store. The baskets hold all of her hats, gloves, scarves and umbrellas. By taking out the single shelf and rod, we were able to get a combination of long and short hang, as well as shelves to store laundry detergents and other cleaners. 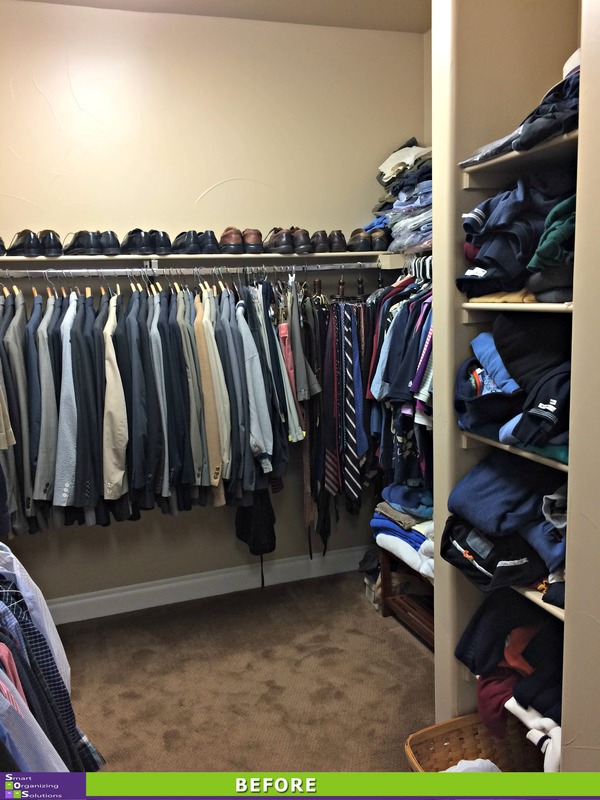 This closet was crammed so full that my client couldn’t really even get into it. 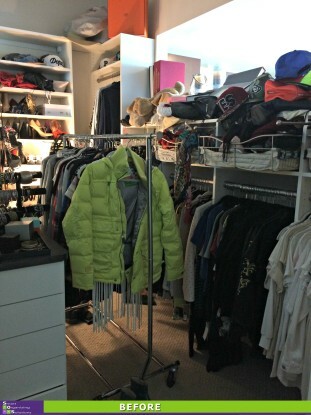 We pulled everything out and designated anything she didn’t want anymore as donate or consign. 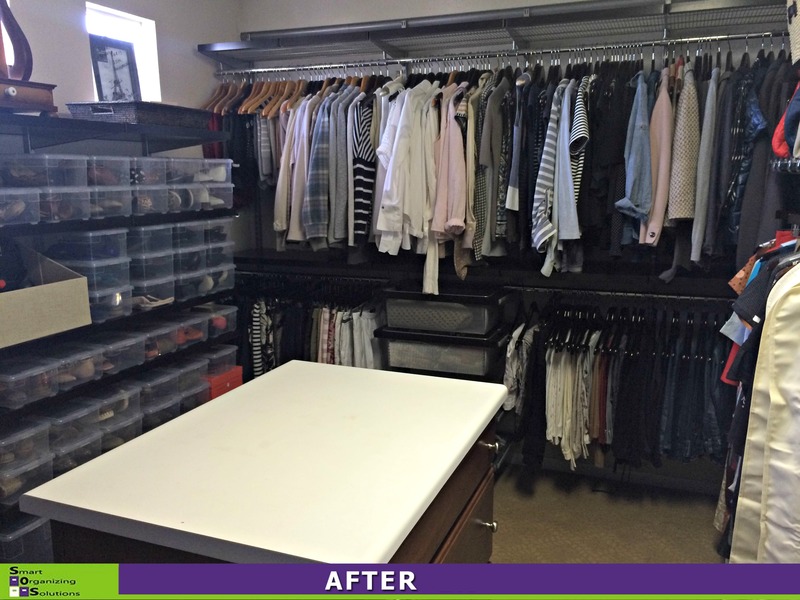 We were able to ditch the rolling garment racks and use the bins she already had to make the space work for her. 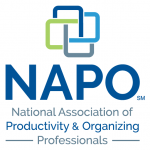 Everything is categorized so it’s easy to see and access. 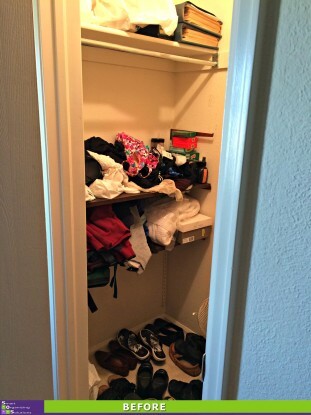 This closet wasn’t working for this Denver homeowner. SOS revamps with a major makeover. 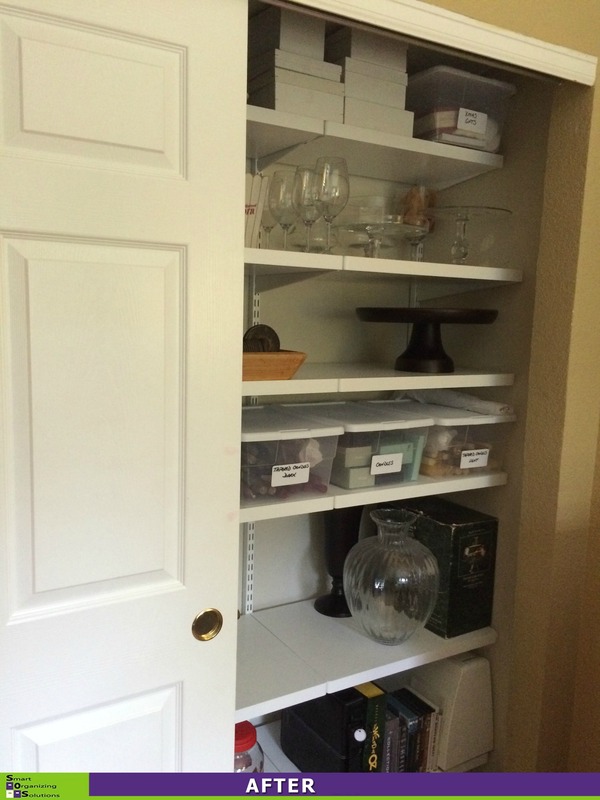 The single shelf and rod were replaced with a fabulous design using elfa from The Container Store. 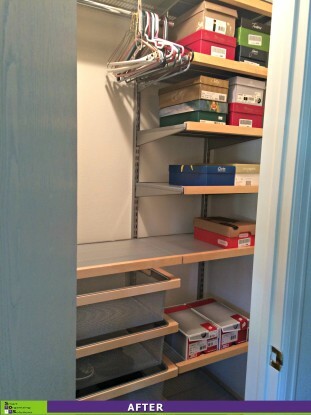 We increased the amount of hanging space, added drawers and dedicated shoe shelves. Wowza! When you entertain often, you collect a lot of table cloths, runners, napkins and place mats. What a treat to be able to dedicate an entire closet to storing them. This closet was being under utilized. 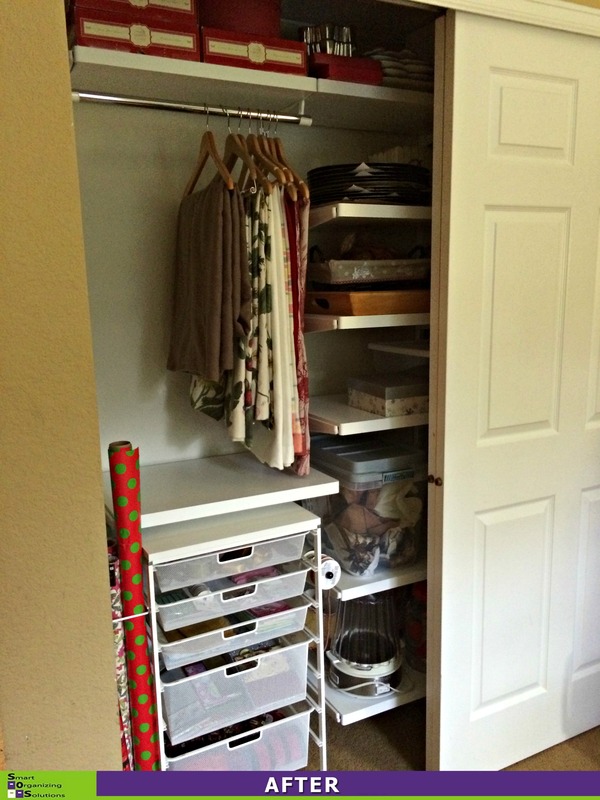 So we turned to elfa from The Container Store to maximize the space and create hanging for the table cloths and runners and drawers for everything else. Because we created a custom plan, we were also able to add shelves above everything for additional storage. 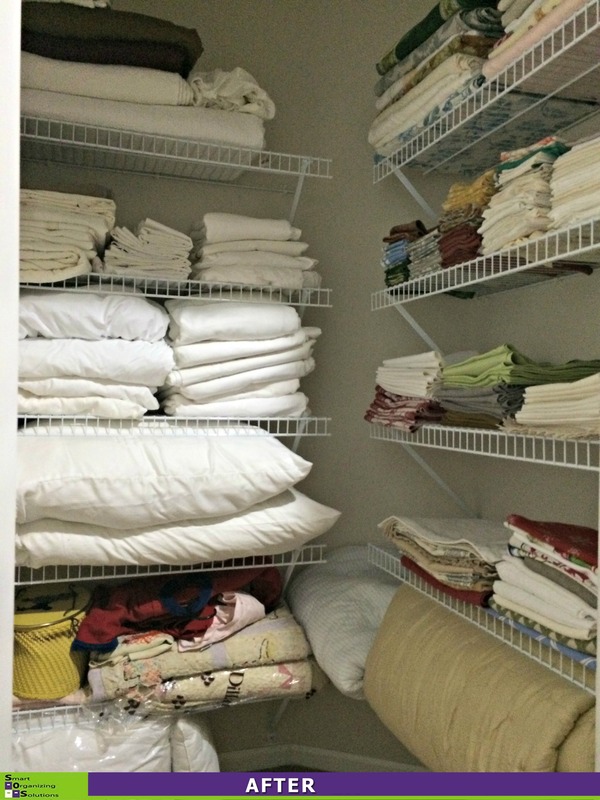 You can have too many linens. 🙂 After pulling everything out of this overflowing closet, we matched sheet sets and towels. We donated anything that didn’t have mates and tossed anything that had holes or stains. 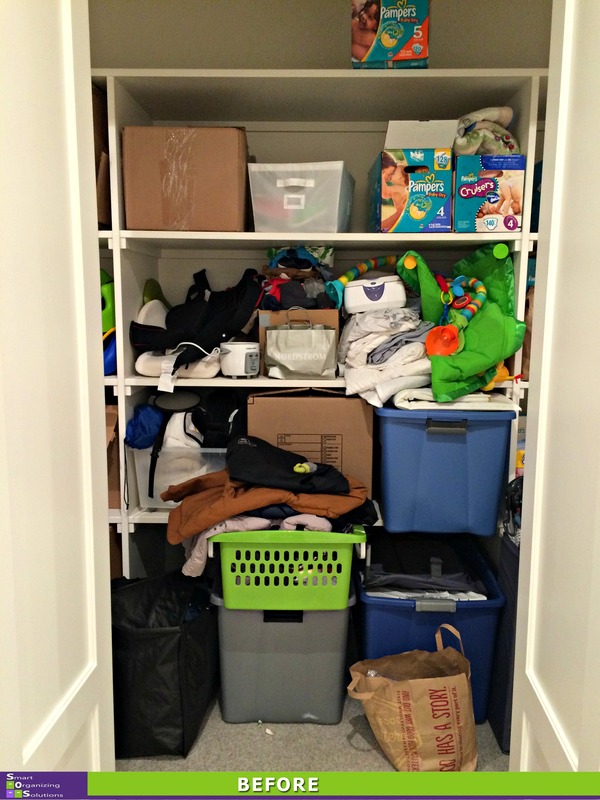 We categorized everything by size: Queen, King, bath towels, hand towels and wash cloths. 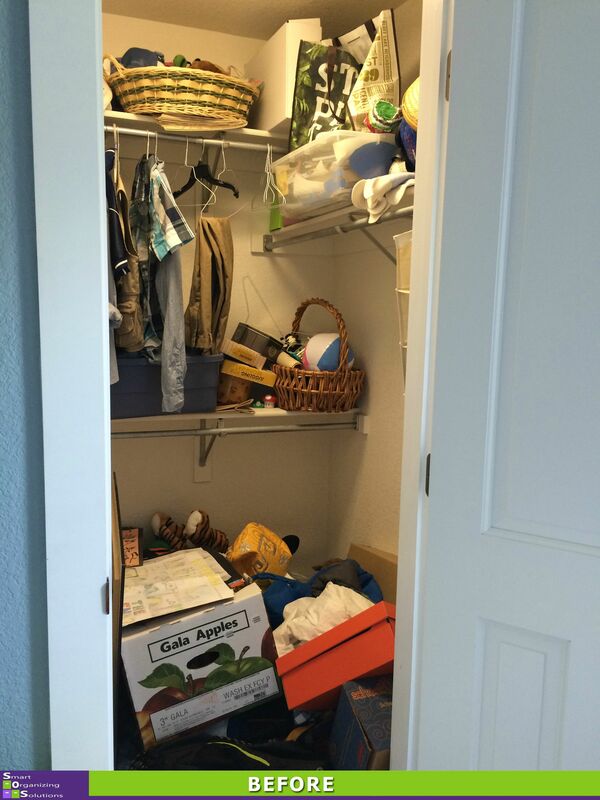 When you see things sorted in this way, you can more easily determine what you can let go of. Once we put everything back, we labeled the shelves so my client can see what sized sheets she has at a glance. New Paint, New Carpet, Newly Organized! 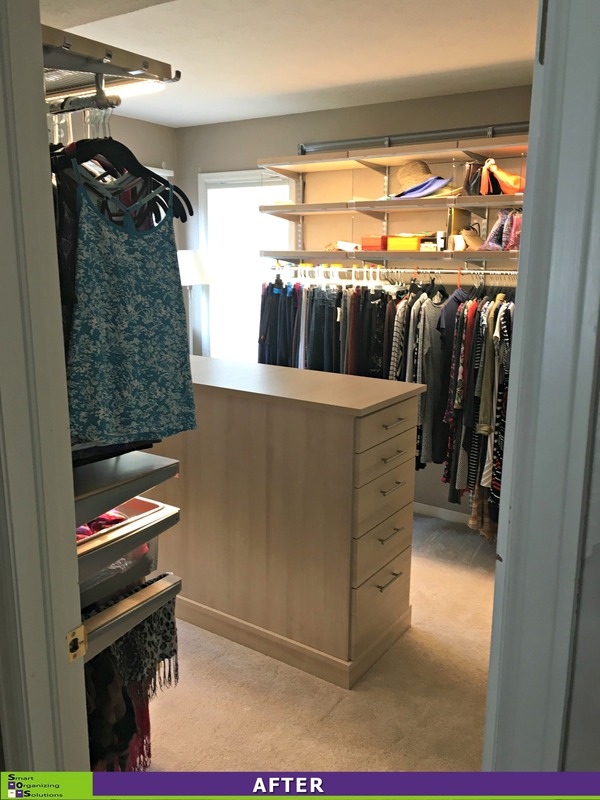 When this Cherry Hills homeowner decided to freshen up her master closet with new paint and carpet, she decided she also wanted SOS to help her get it organized. Fun! 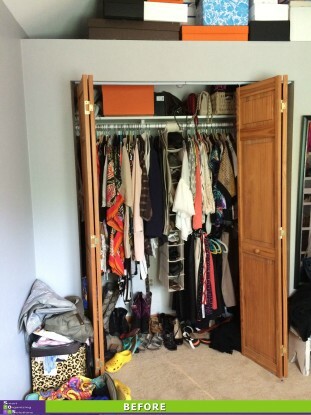 This has to be one of the widest reach-in closets I’ve ever seen…and it needed a massive makeover. It was time to replace the single shelf and rod with something to maximize all that fabulous space. We turned to elfa from The Container Store. 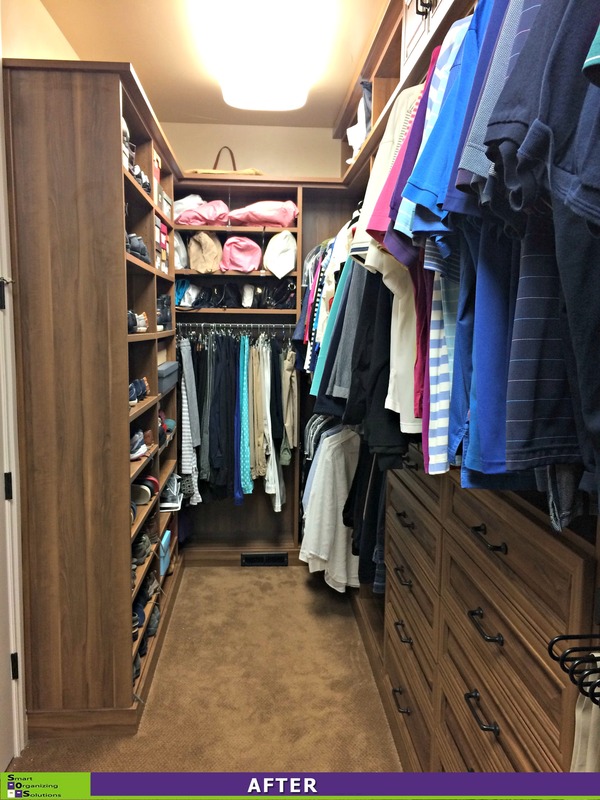 We increased the amount of hanging space, added loads of drawers, customer shoe storage and even a gliding pant rack that we used to hang scarves. Fabulous! I love it when I get to be a part of a client’s remodeling project. This Denver couple was so excited about their master bedroom overhaul but needed some help designing the closet. 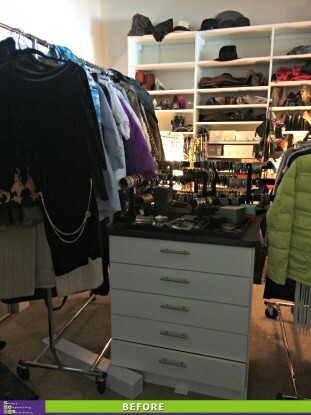 They needed loads of drawers, shelves for shoes, a combination of short and long hang and a vanity area for doing makeup. Voila! 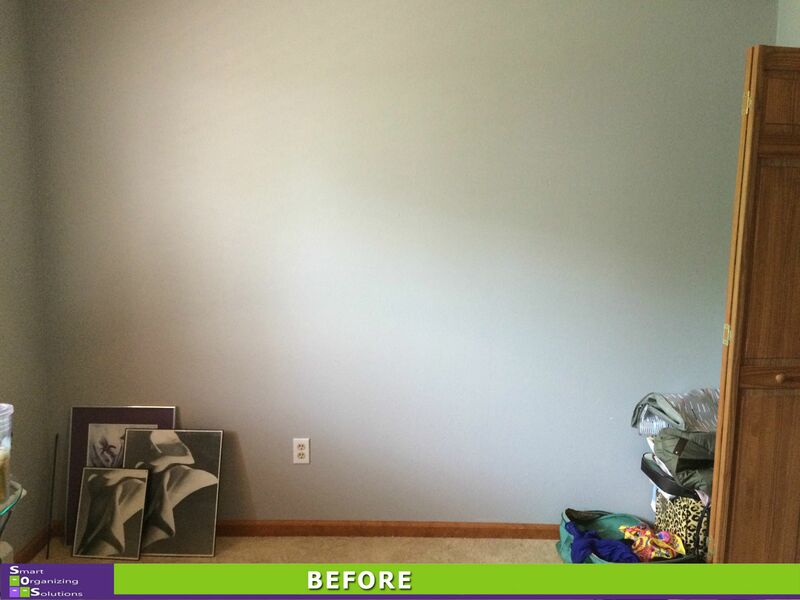 From drywall to dazzling! 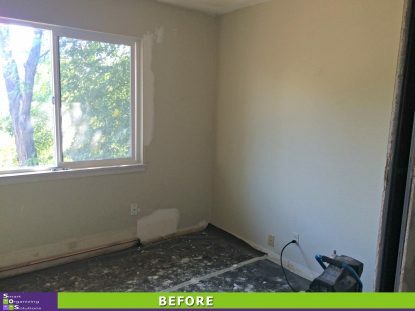 This Denver couple was in the middle of remodeling their soon-to-be new master bedroom. 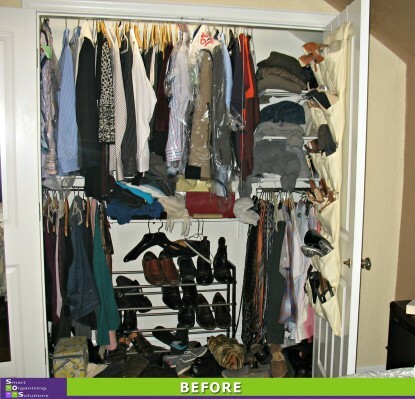 They called SOS to help them come up with a closet solution. 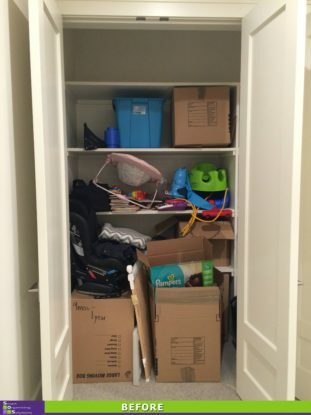 With nothing but cardboard and tape to indicate the desired location for new walls, SOS created a hidden closet with loads of storage. Every once in awhile, someone extra special comes along and reminds me of why I love what I do. When this Littleton woman called me, she was frustrated. 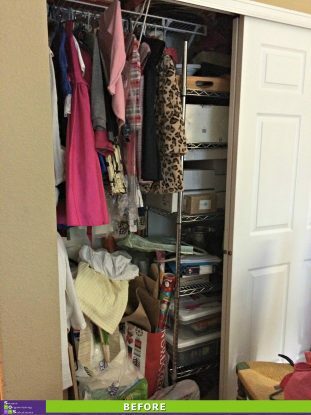 It wasn’t because her closet was all that cluttered…it was because she couldn’t easily get into it to reach her clothes. You see, she’s in a wheelchair and the space was too tight and the hanging up too high. 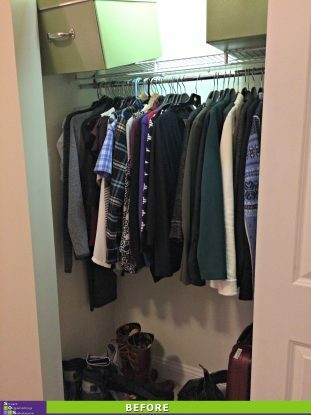 She had to ask her husband to get her clothes for her almost every day. So we re-designed the space and brought everything down to a height that is easy for her to reach. 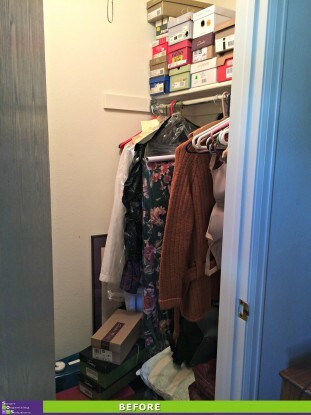 We took away some shelves near the entrance of the closet to make it easier for her to roll into the space, but added shelves elsewhere so she didn’t lose storage. Her treasured gift wrap is easy to see and easy for her husband to get down for her when she needs it. But best of all, she gets to enjoy being a little more independent…and that is a wonderful thing. 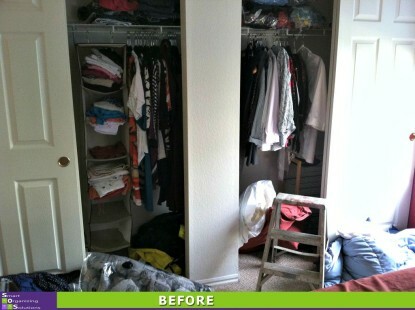 This Boulder client had long wanted to transform this multi-purpose room into her dream closet. 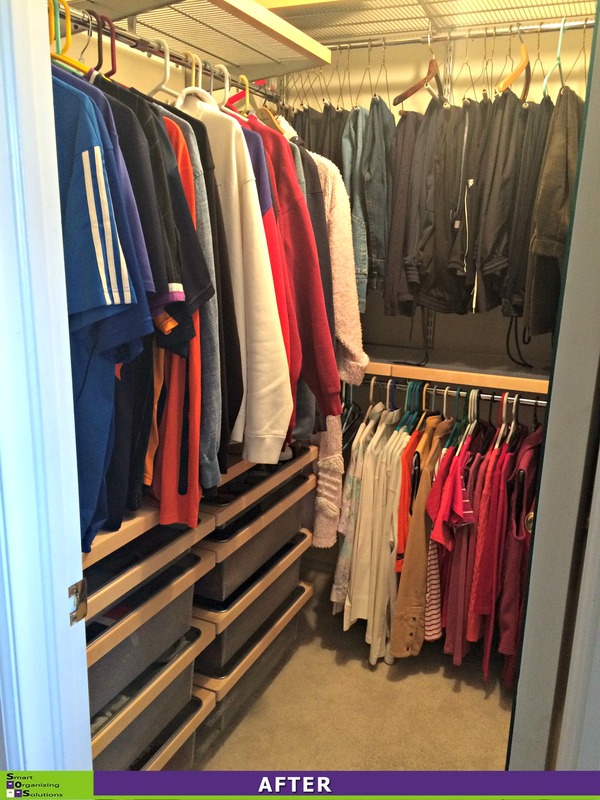 SOS helped design the space, combining both elfa and TCS Closets from The Container Store. We used the main walls of the room for hanging. 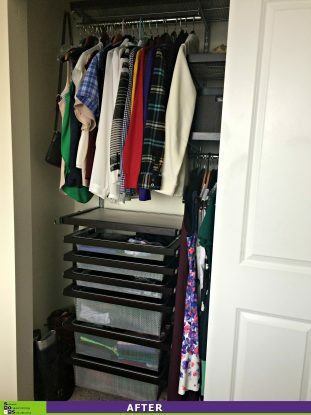 We also made it easy for her to see all of her beautiful scarves by folding them on a pull out pant rack instead of tucking them away in drawers. We topped off the space with a gorgeous island for her jewelry and other folded items. This Denver client needed help maximizing and organizing her small closet. The single shelf and rod running across the middle of the closet were wasting space. 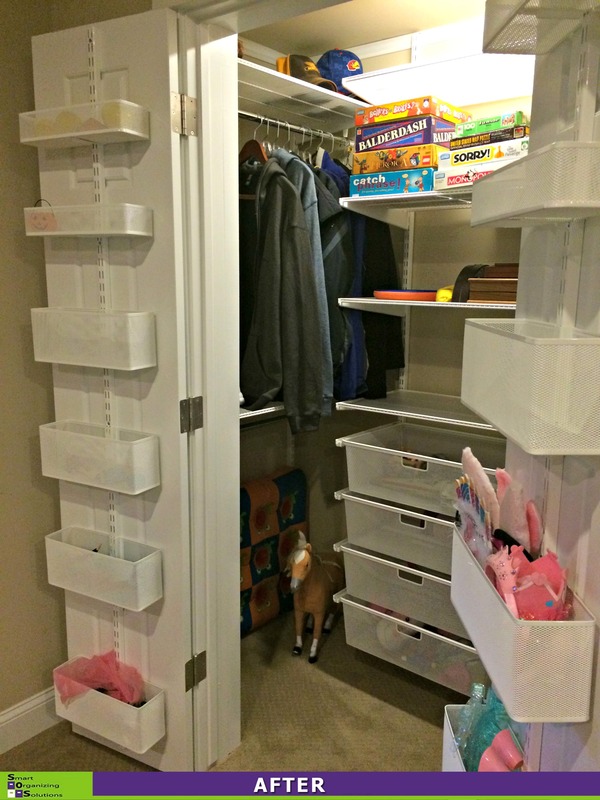 Using elfa from The Container Store, we added so much storage! 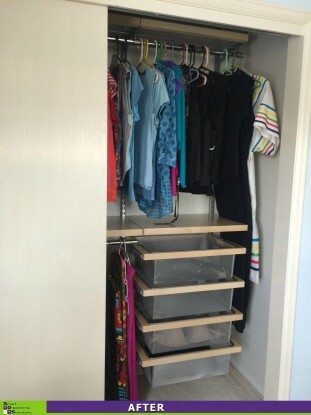 She now has the same amount of hanging space, but also has drawers, shoe shelves and additional shelves for storage. 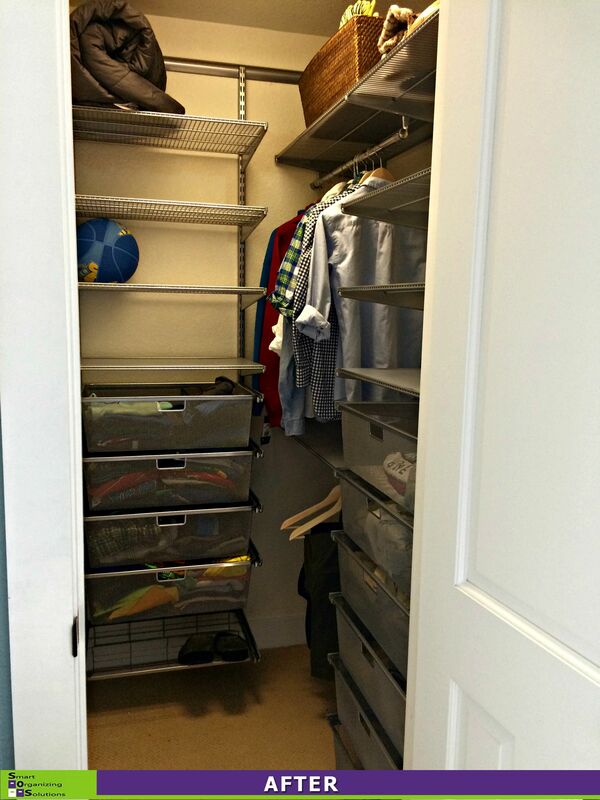 While this closet at least had plenty of hanging space, this client needed drawers and shelves. 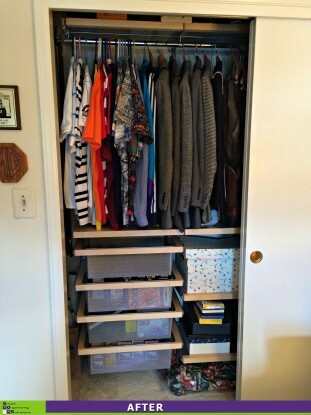 We turned to elfa from The Container Store to better utilize every inch. We also took advantage of the tall ceilings to create extra storage for out-of-season items. Dreamy isn’t it?! 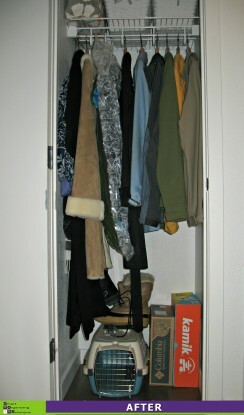 A jumbled mess of coats and shoes is now neat and organized. By utilizing the full height of the closet, SOS created more hanging space as well as shelves. 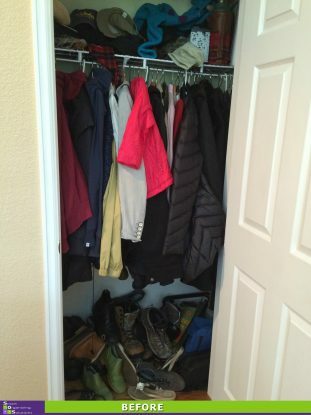 Now all of the shoes are easy to see and the coats are easier to pull out and put away. This spare bedroom closet was crammed with assorted clothes, kitchen and decorative items, tubs of DVDs, VHS tapes and more. 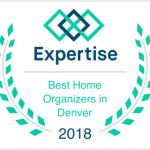 This Longmont client was overwhelmed every time she opened the doors. SOS to the rescue! We created an organized space with clearly defined homes, a gift wrap station AND a place where the occasional guest can hang clothes if need be. 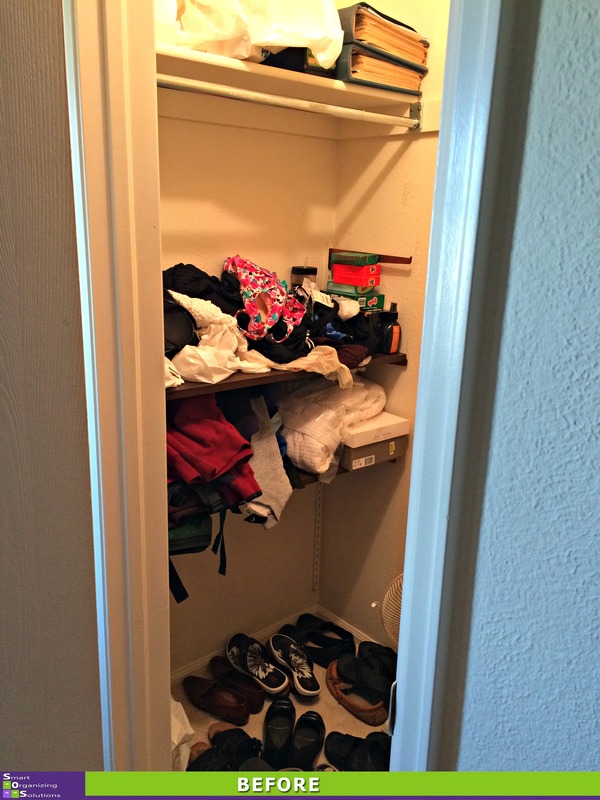 When this couple in Broomfield moved into their new home, they knew this tiny closet needed some help. 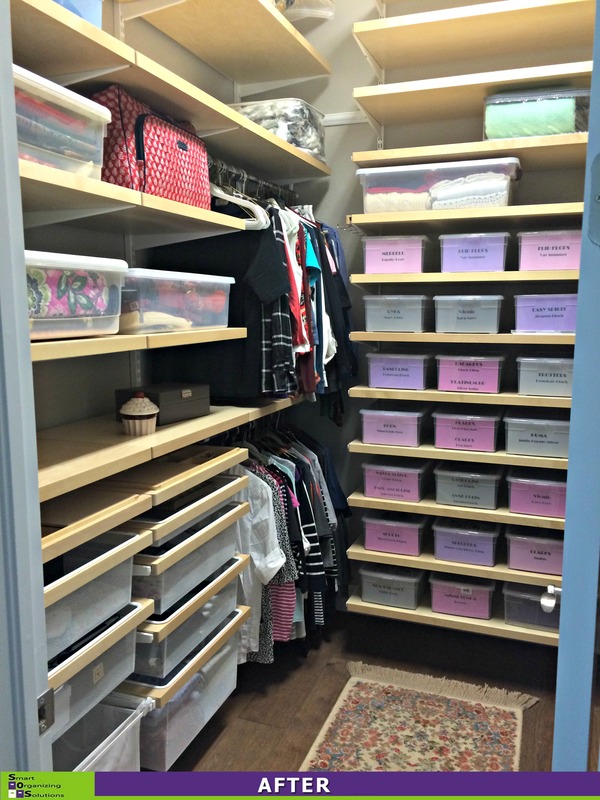 SOS designed a space using elfa from The Container Store to maximize every inch. 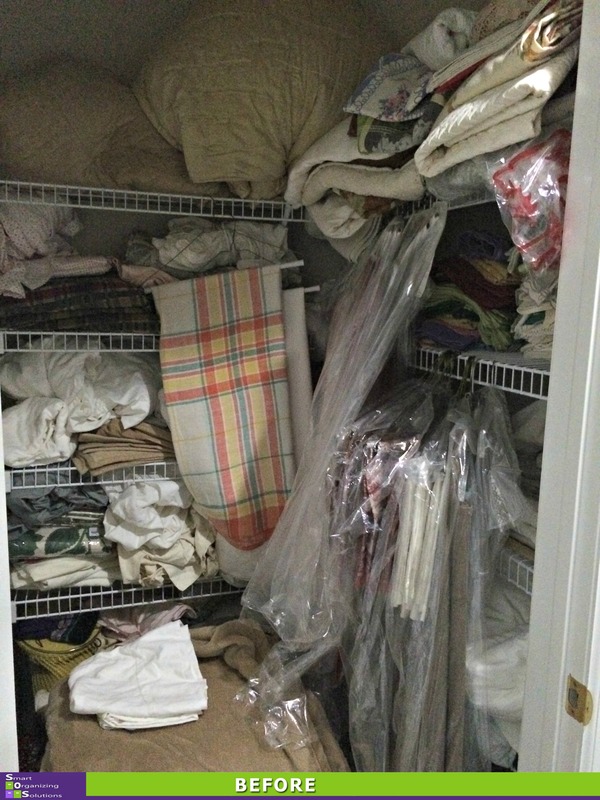 While this Longmont client has a fairly good sized linen closet…she also has lots of linens. 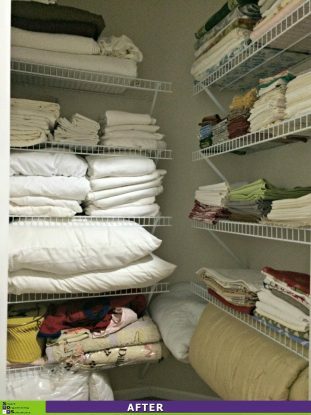 🙂 Comforters, extra sheets, pillows, table clothes, table runners and cloth napkins were hard to see, let alone access. The first thing we did was pull everything. Next, the plastic bags went in the trash. All of it was staying, so we worked out the best way to fold everything so it didn’t take up quite as much shelf space. Voila! 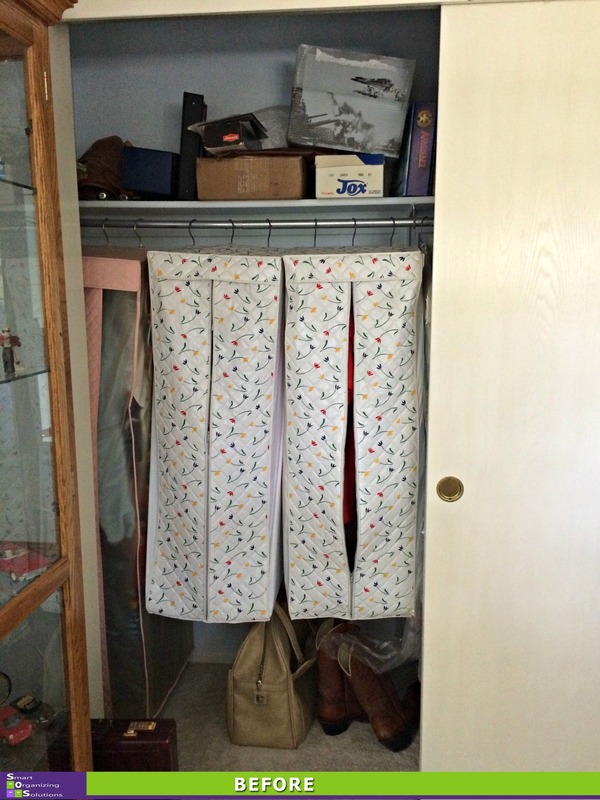 An organized linen closet. A single rod and shelf make it difficult to maximize closet potential. When this Stapleton mom called me, she was in desperate need of closet makeover. 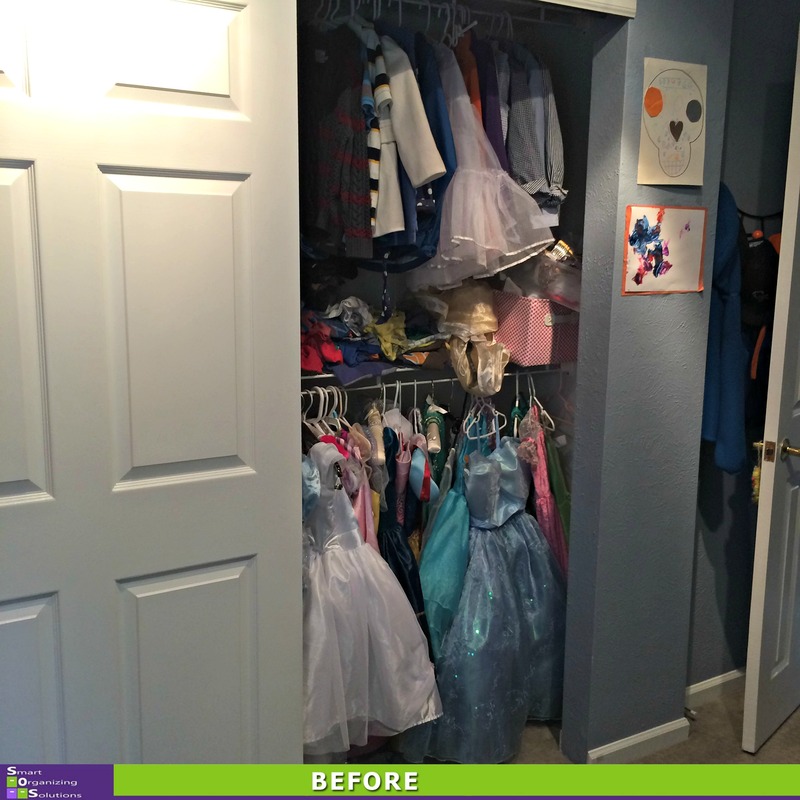 This space needed to serve as a toy storage area, a princess dress up area, the family game storage center and hold all of the overflow of coats and jackets for a family of 5. We turned to elfa from The Container Store. 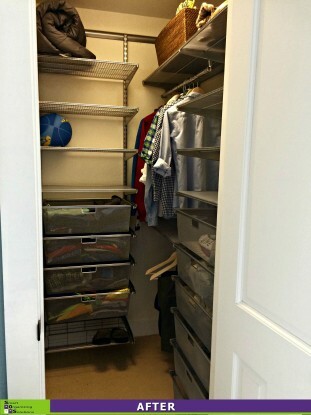 With additional shelves, hanging rods, drawers and door baskets, we tapped into every inch of storage space. Now there’s a place for everything with room to grow! 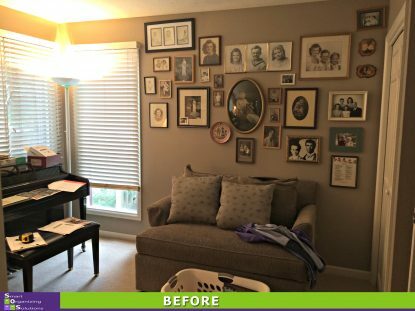 This Longmont client wanted her granddaughter to feel right at home when she spends the night. 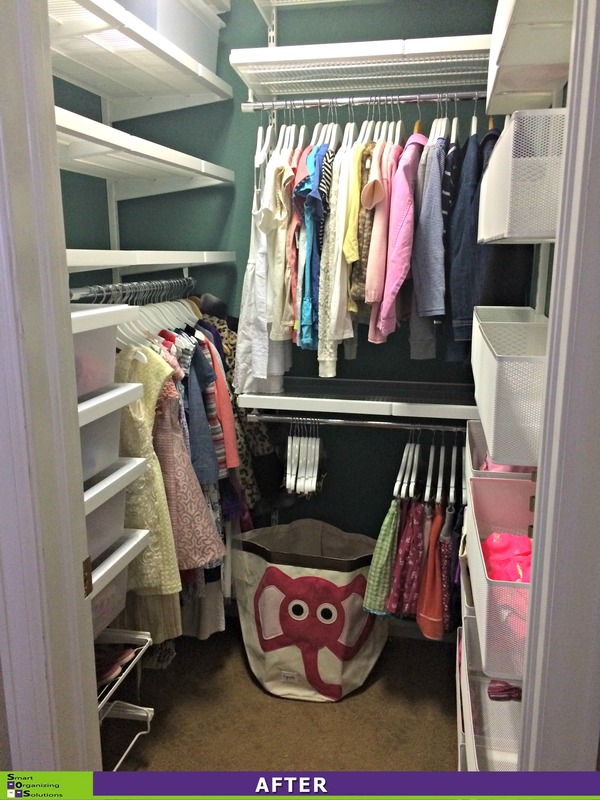 So SOS turned this storage closet into a little girl’s dream closet. 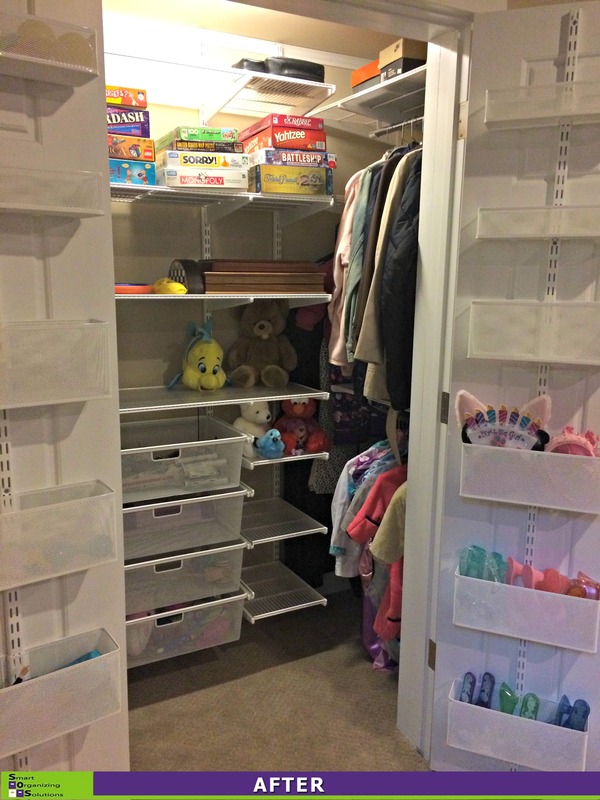 Knowing we needed to start from scratch, we designed a new layout with elfa from The Container Store. 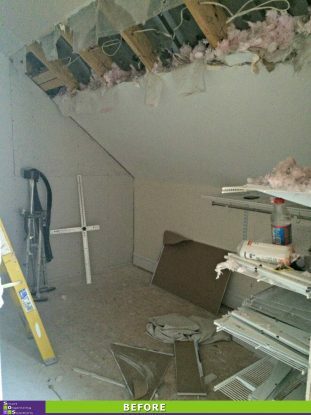 Then we emptied the space, took down the existing rods and shelves, removed the door and painted the walls. And, voila! 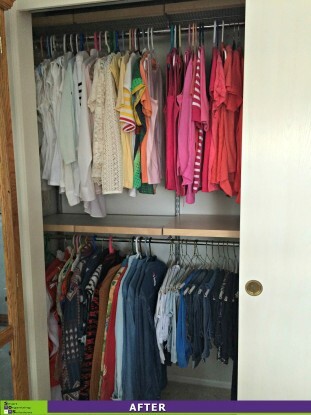 A closet this lucky girl can call her own and grow into as she grows up. The first thing we did was remove everything from the closet. Unfortunately, the shelves were not anchored properly and everything came tumbling down when we lifted the first stack of stuff. Ouch! 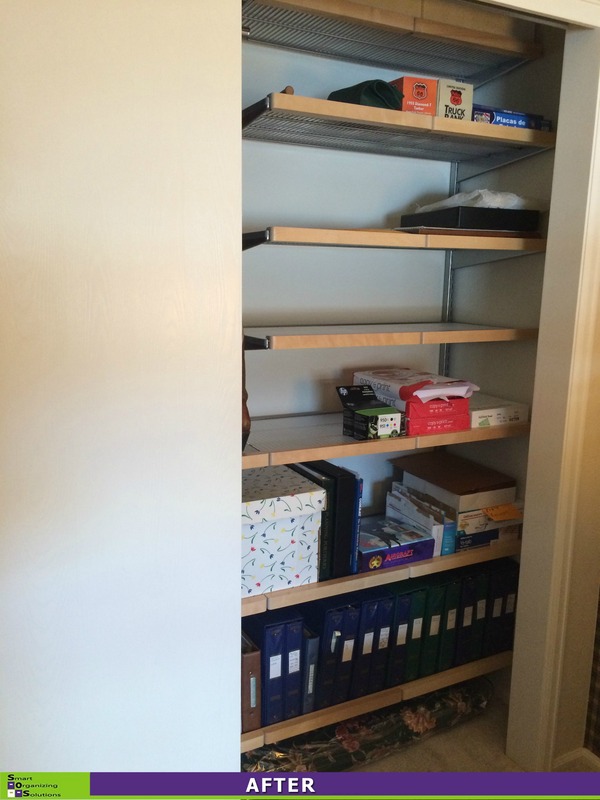 So the next step…we replaced the skinny shelves with some deeper shelves for sturdier storage. We separated empty albums from filled ones. We took all of the picture frames and separated new ones from old ones that needed updated photos added. We opened all of the boxes and gathered all of the loose photos and put them in a couple of big bins to be sorted later (think winter picture project!). 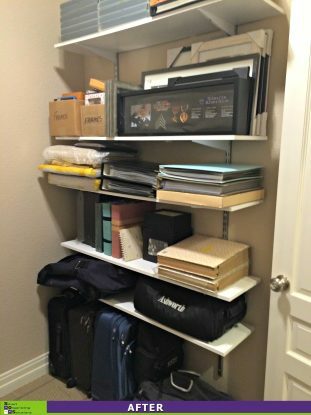 We put empty albums on the top shelf, frames on the next, and filled albums on the next 2 shelves so they could be enjoyed. We freed up space on the floor for carry on luggage. 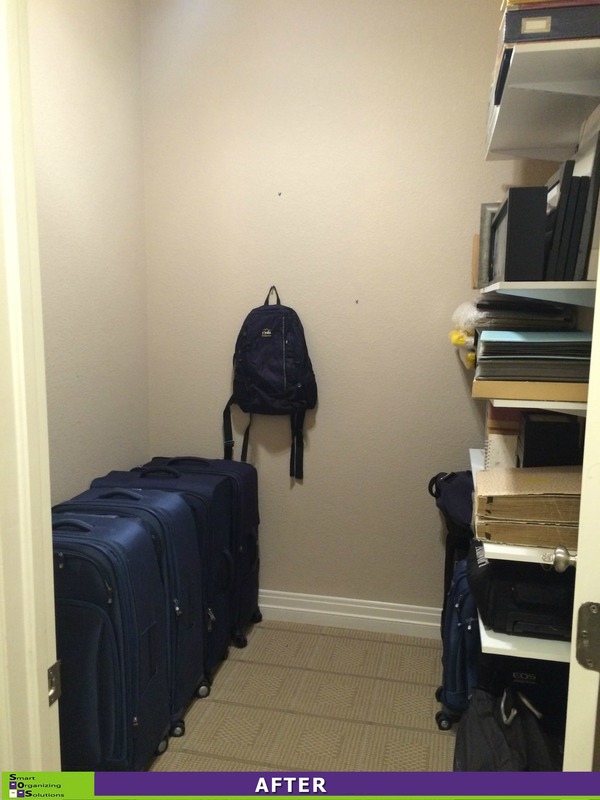 And with the floor clear, we had room for their bigger luggage on the other side of the closet. 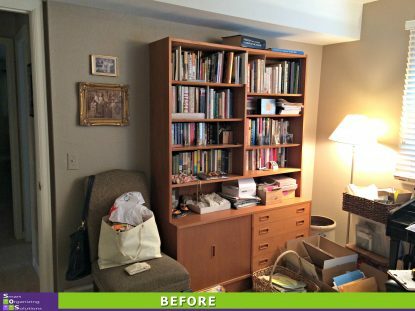 This basement closet lacked shelves which quickly turned the space into a catchall for everything these homeowners didn’t know what to do with. 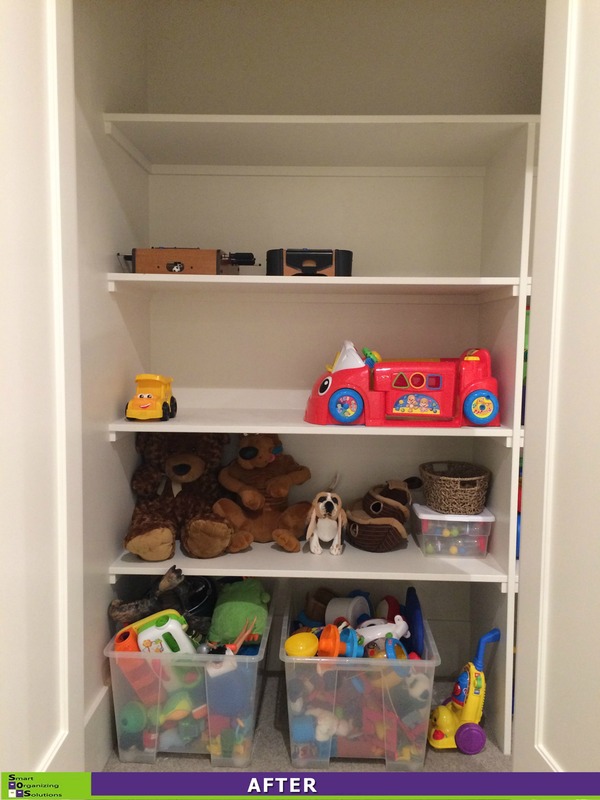 We designed our shelving around the deep recessed walls on each side of the opening. On the right side, we created hanging space for a wedding dress and other clothing items that are rarely worn. 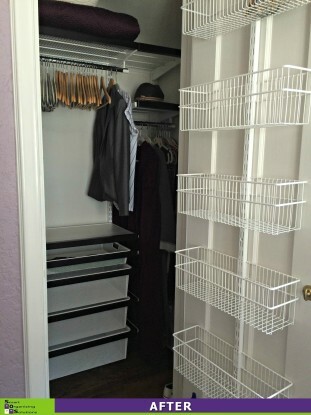 The rest of the closet is all shelves. The far left side is used to store memorabilia bins that won’t be accessed very often. That leaves everything the homeowners need right in the middle where it’s easy to see. We did a lot of sorting, purging and organizing. We were able to re-use all of their existing bins and drawer units which had been emptied after other organizing projects. The final step…labels! What once was a jumbled mess is now organized bliss. 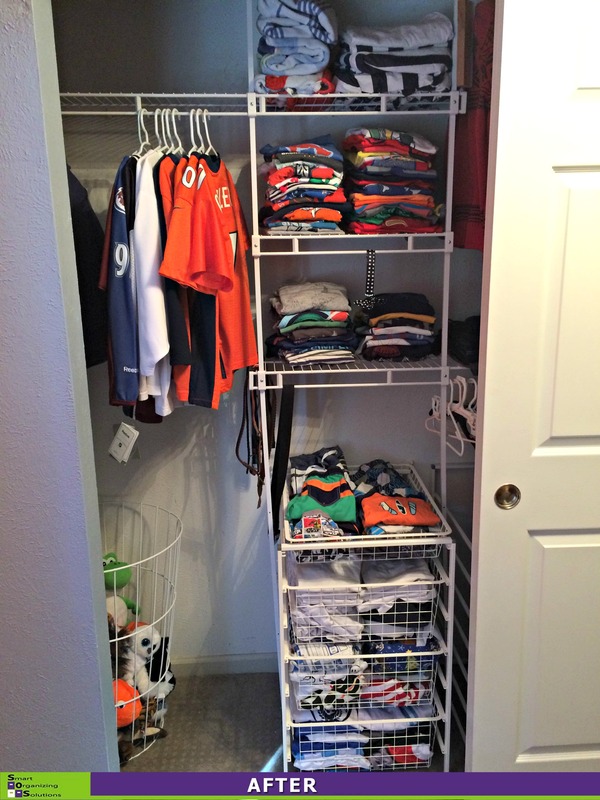 This little boy in the Wash Park area was very generous with his closet. He let his sisters put all of their princess dress up outfits, shoes and accessories in one side of it. That also meant, they (and their friends) were in his room a lot. 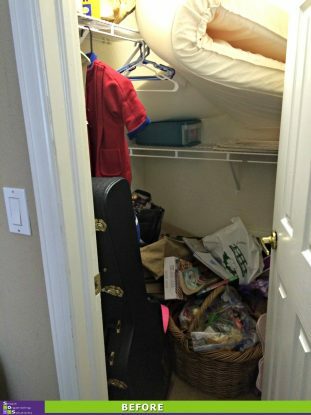 You can imagine how happy he was to reclaim his space! 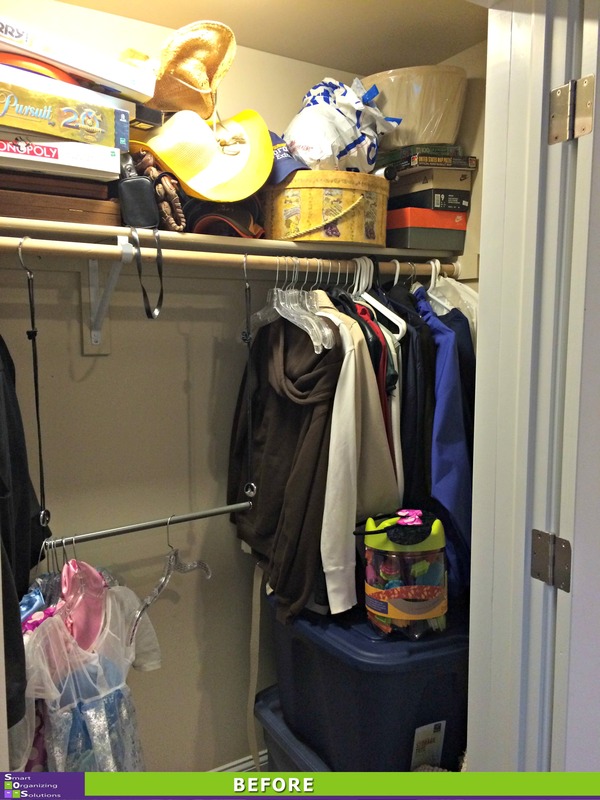 We made room in an off-season clothes closet in the basement and moved all of the dress up items there. We took an unused drawer unit sitting in the basement storage room and moved it into his closet. 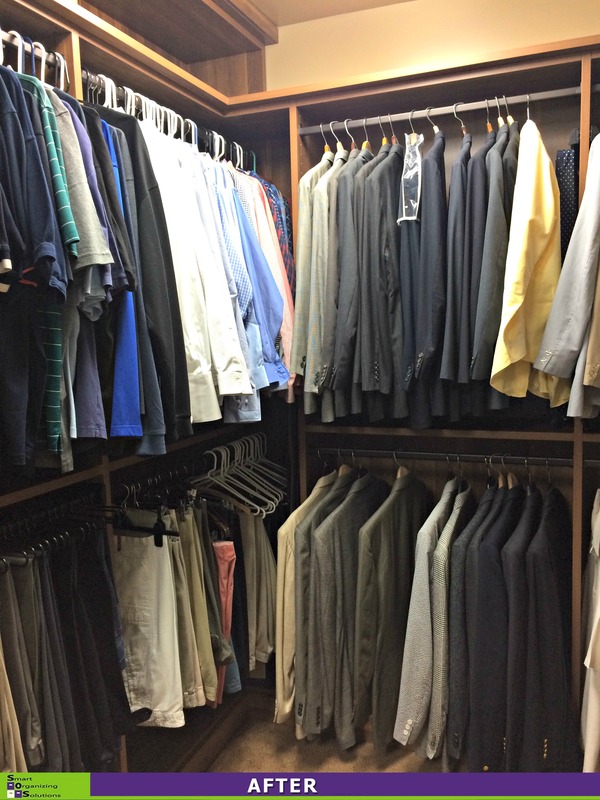 A little sorting and folding is all it took to get his closet organized. 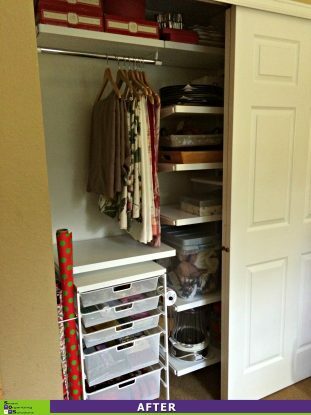 This space already had elfa from The Container Store. 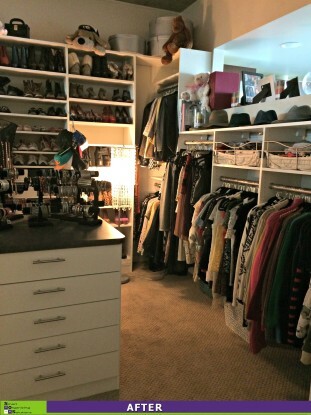 But this beautifully designed closet needed to be organized. 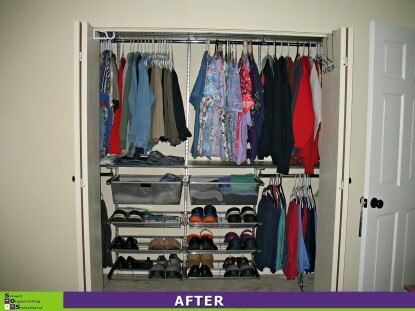 With plenty of hanging space, shelves and drawers, it was simply a matter of categorizing clothes to keep like with like. 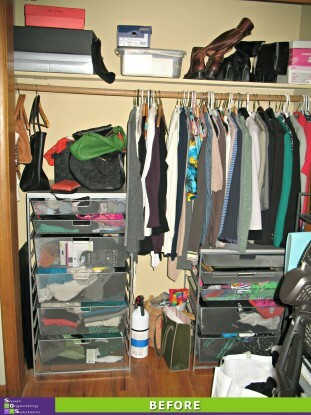 We also re-folded most of the items on her shelves and in the drawers to maximize those spaces. 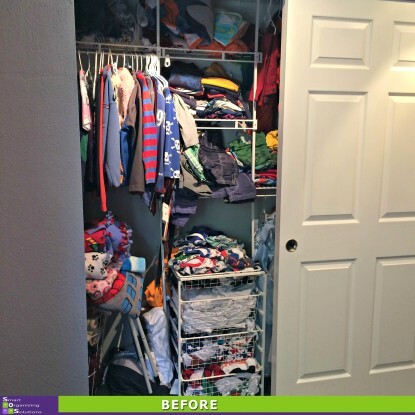 It truly is amazing the difference folding can make. 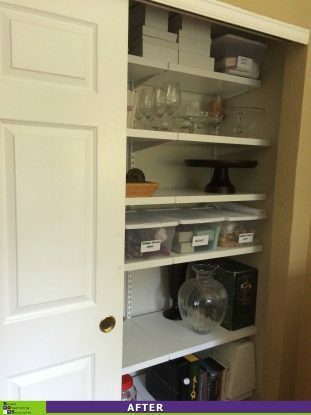 When we were finished, we even had an extra shelf to display her jewelry! When I see a room like this, my first thought is “This is going to be fun!” And it was. 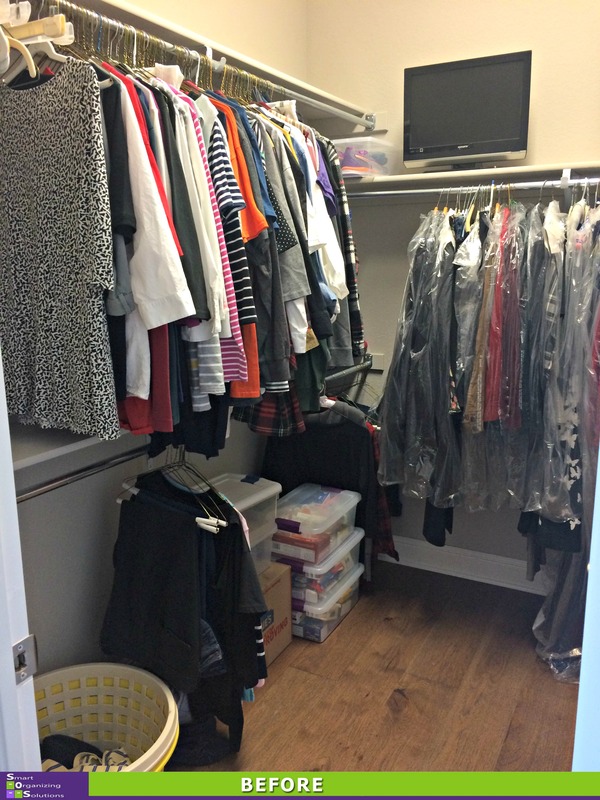 We divided the space to make it a combo closet and craft room. 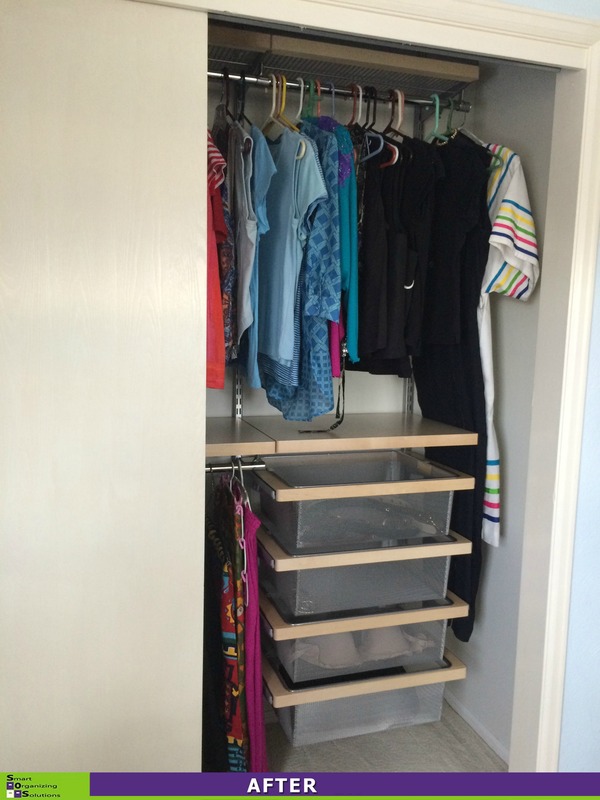 We used elfa from The Container Store to make the space more functional. 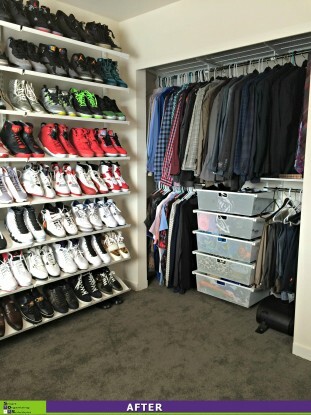 One full wall was to be devoted to his shoes. And what an impressive sight! 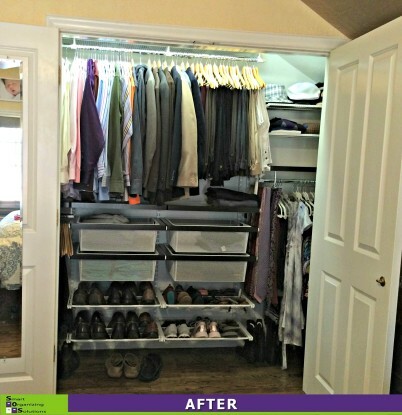 In the “Before” photo, his shoes are nowhere to be found – that’s because they were all over the house: the master closet, the master bedroom, the basement, the garage, the living room…you get the idea. Once I had them all together, it was time to get them up on those fabulous shoe shelves…color coordinated, of course. I then tackled the other portion of the closet. 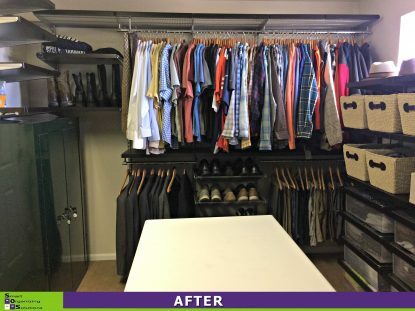 We took the doors off the original reach-in to make his clothes more accessible and to make that entire side of the room more “closet-like.” Sensational, isn’t it?! 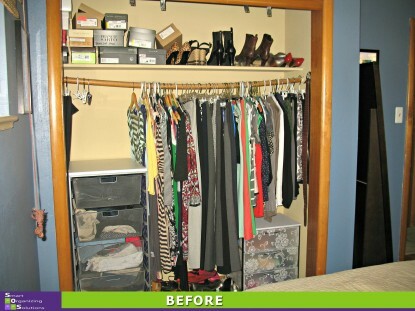 This small spare room closet needed a makeover. 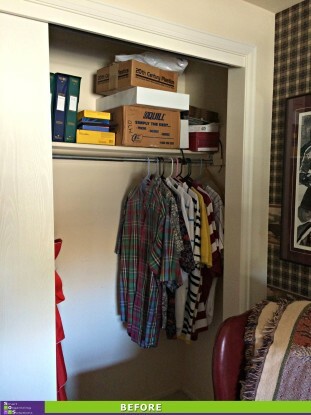 The two small side wall solutions weren’t taking advantage of the closet’s height or width. So we decided to revamp and install Elfa from The Container Store. This allowed us to get hanging, drawers and loads of shelves in the space. Now shoes are easy to get to, swimsuits and travel items are tucked away in drawers and the hanging space is nice and neat. 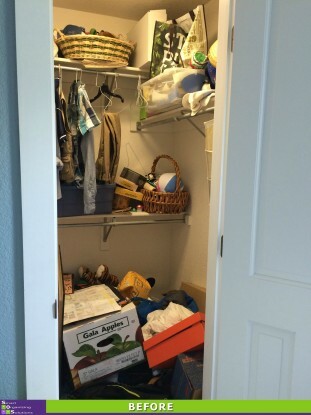 Clothes in bags, boxes of light bulbs, office supplies and a coin collection were fighting for space in this closet. SOS and a closet re-design to the rescue! 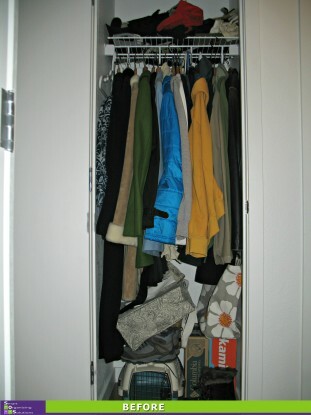 We turned another closet in the home into a combo of off-season clothing and storage for the other non-clothing items. Now this Centennial homeowner has a closet dedicated to the things she loves to wear. 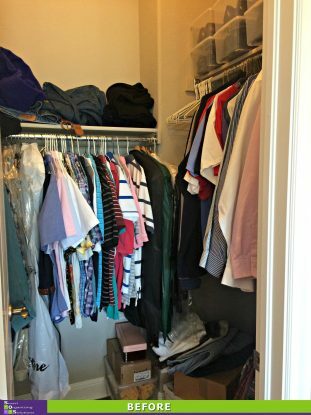 This closet had become a catch all for off-season clothes, old costumes, office supplies, memorabilia, photos and other assorted items. A single shelf and hanging rod just wasn’t cutting it. 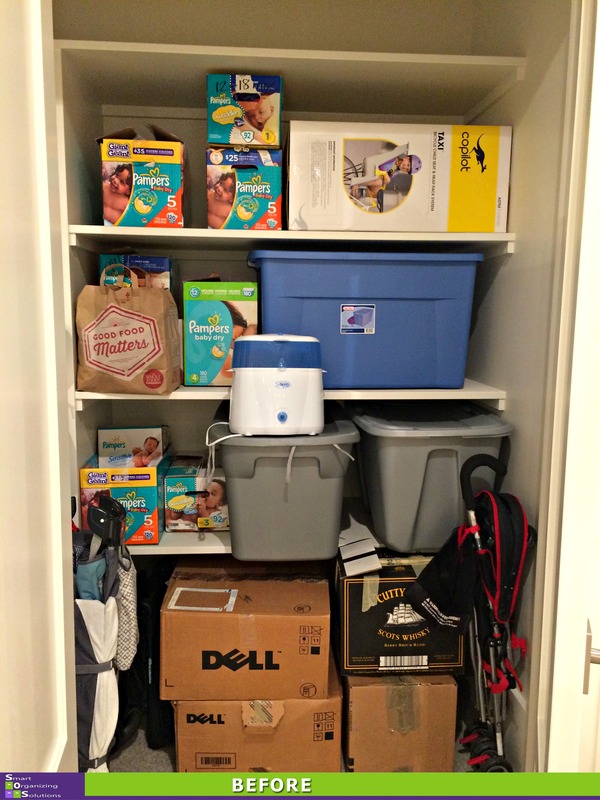 So we turned to Elfa from The Container Store to update the space and make it more functional. 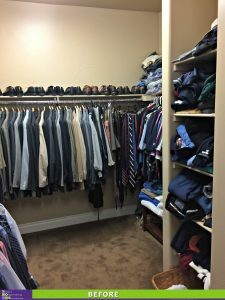 There wasn’t much tossed in the donation pile, but by adding shelves to one side of the closet, we created loads of more usable space. 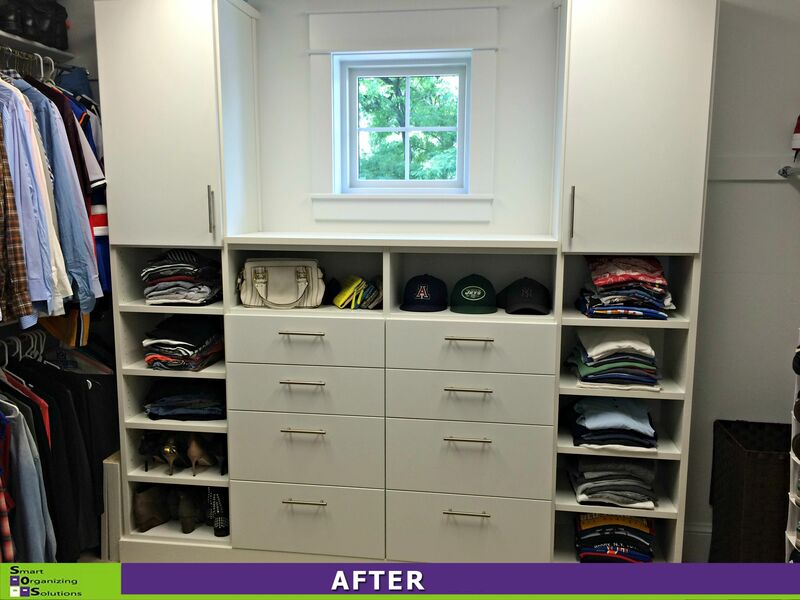 This master closet was in need of a little sprucing up. 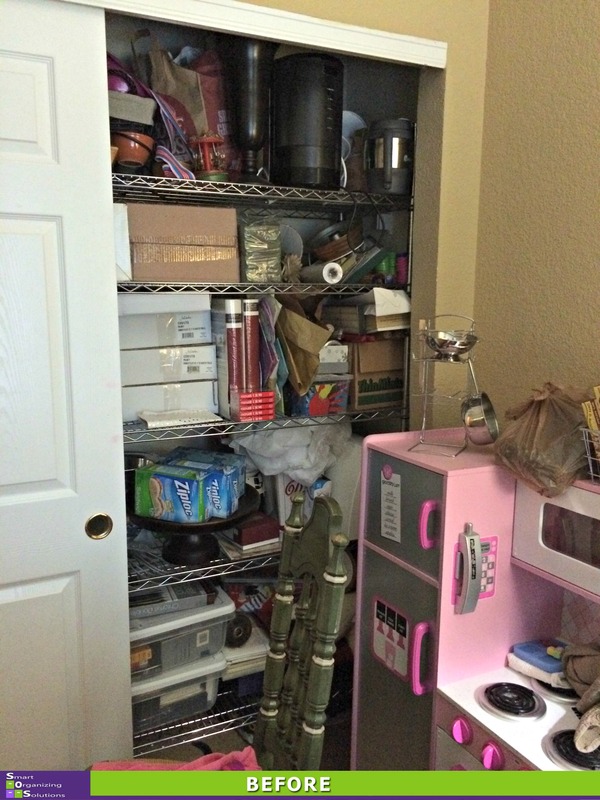 We purged the items to be donated and then devised a plan to maximize the space and get things off the floor for good. 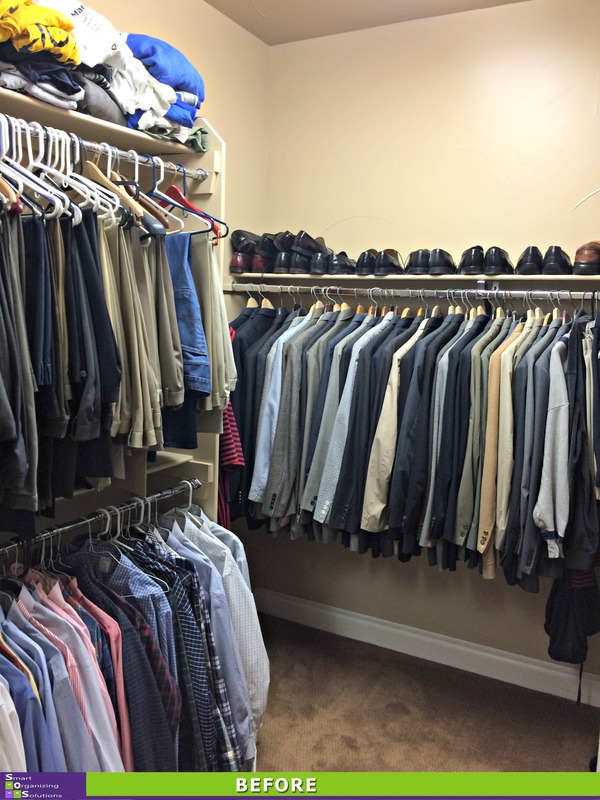 The walls got a fresh coat of paint and once the new closet system was installed, we put everything back. Now everything has a home and is easy to find. There’s even room to grow! 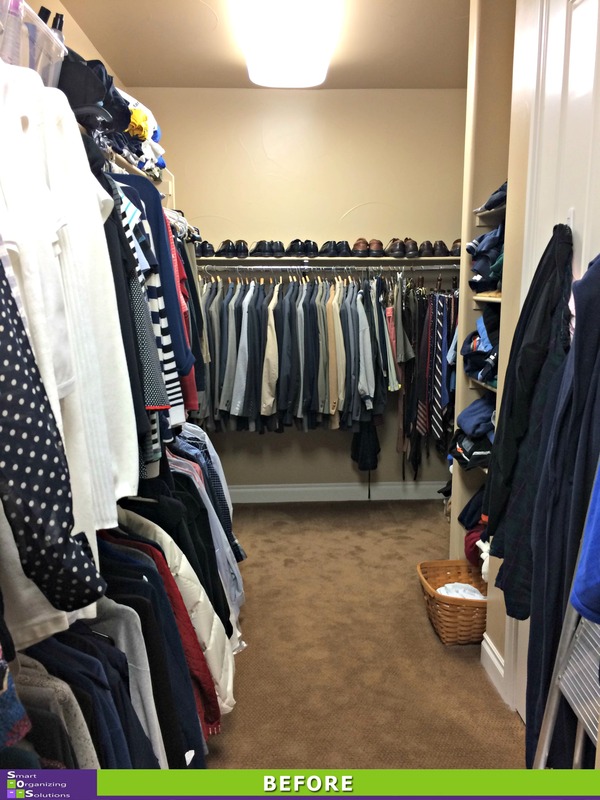 An entire room devoted to being a closet! Pretty much every woman’s dream. 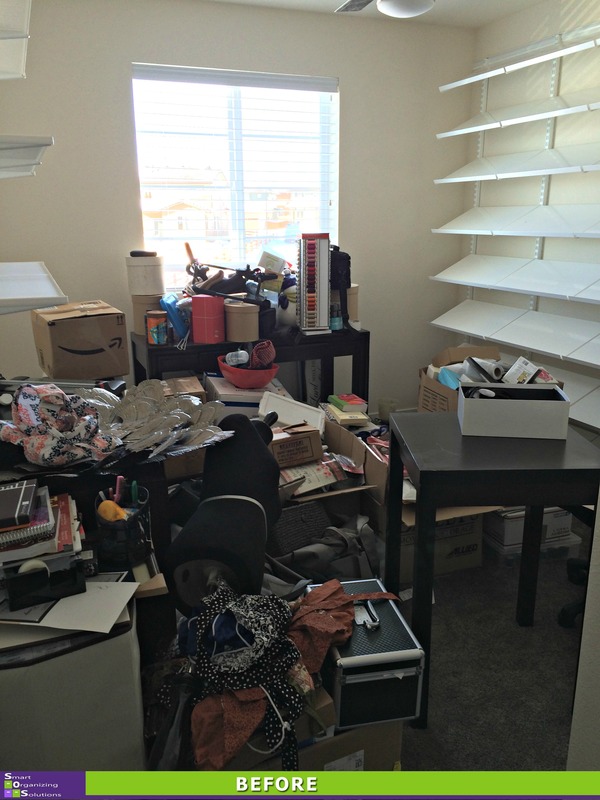 But for this Denver client, it had become a nightmare of chaos. 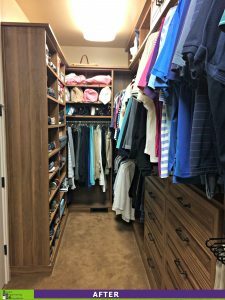 Every inch inside the mirrored closet doors was crammed with clothes and there were 5…yes, I said 5, rolling garment racks crowding the rest of the space. There was barely room for her to walk let alone know what she had to wear. 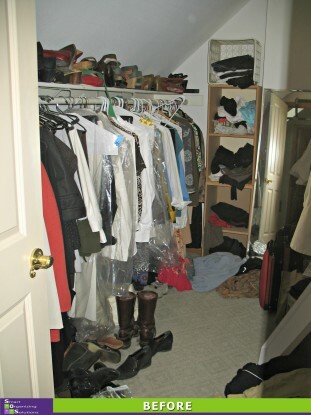 But she embraced the process and parted with loads of clothes, shoes,purses and hats, many of them with tags still attached! Each hanging section is now devoted to a certain type of clothing: t-shirts, tank tops, jackets, skirts, dressy shirts, sweaters, etc. We also hung everything backwards so she can see easily at the end of the season which clothes never came off the hanger. 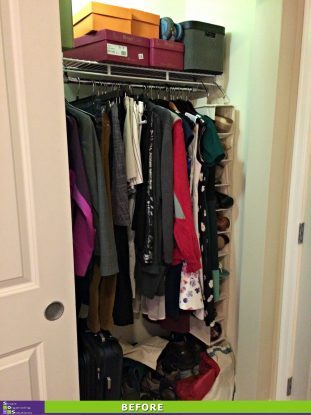 Shoes are now neatly lined up by type on the shelves making them easy to see and step into, while purses were given shelf space behind mirrored doors where they’d be free from dust. Eventually, she plans to install a chandelier for better lighting. The pictures on this one speak for themselves. This Denver Mom was at her wit’s end with her son’s closet. Since he didn’t have drawers or shelves, he simply dumped stuff on the floor. 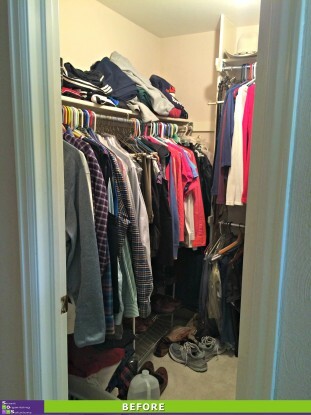 Now everything has a home which makes it so much easier for him to get things out and put thing back where they belong. 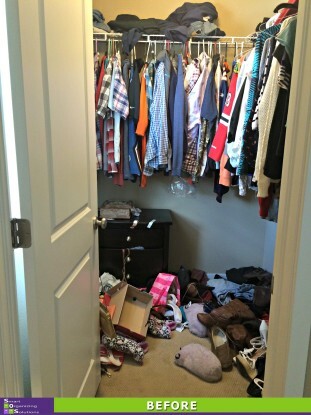 This Denver homeowner was the first to admit that her small walk-in closet was a hot mess. Stacks of clothes on shelves, the floor and in overflowing bins made it nearly impossible for her to see what she had, let alone dig it out to wear it. The first thing we did was pull everything out so we could see what we had. 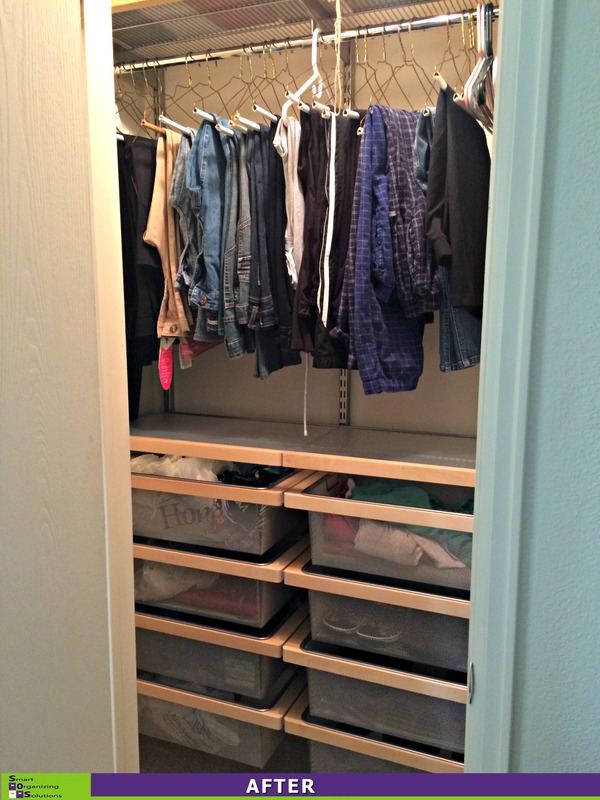 She desperately needed drawers and shoe storage and we decided a complete new closet system was in order. We went with Elfa from The Container Store. 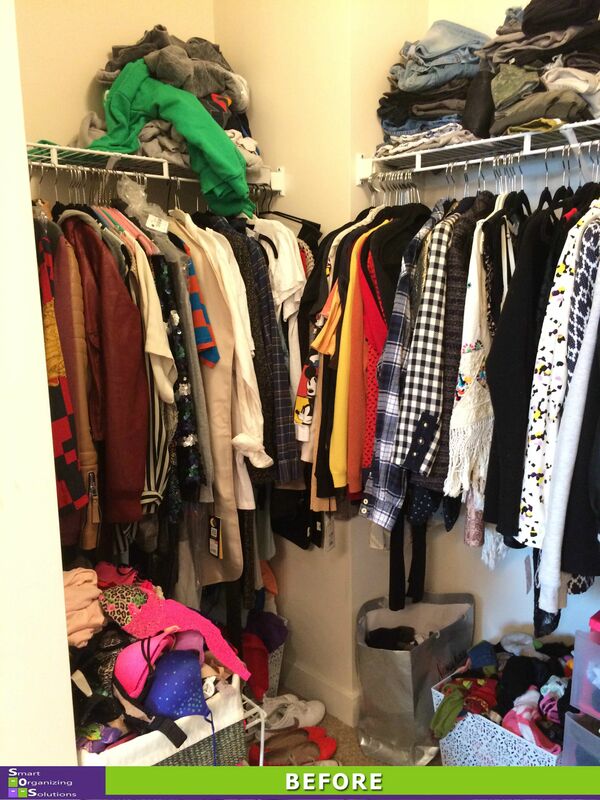 We also did a major purge. 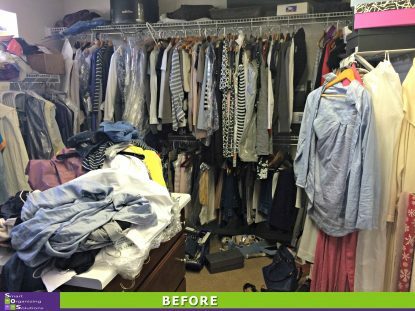 She donated clothes she no longer wore, that no longer fit or were no longer in style. With the addition of drawers, shelves and double hang, we increased her storage space. And by categorizing her clothing when we put it away, we reigned in the chaos. 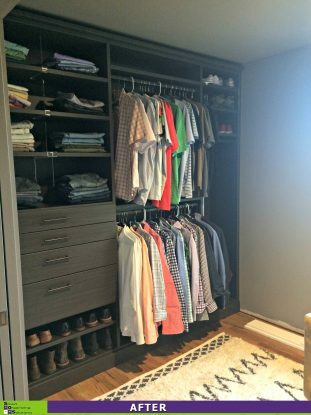 When this Denver couple bought their newly revamped house, they were less-than-thrilled with the master closet. They wanted a place for folded clothes, shoes, hats and purses. 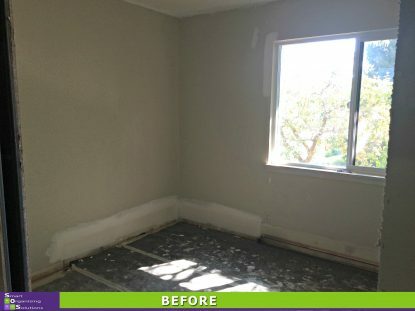 We decided to put together a custom solution around the window and leave the side walls for hanging. 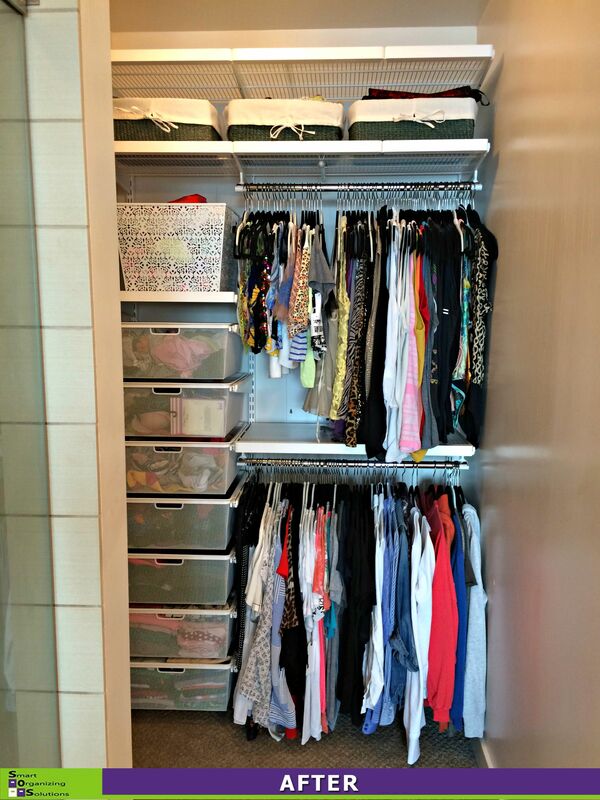 A simple but smart solution for a more organized (and pretty!) space. 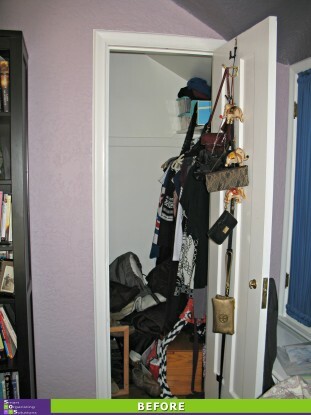 A crammed reach-in closet with bi-fold doors was stressing this Boulder woman to the max. 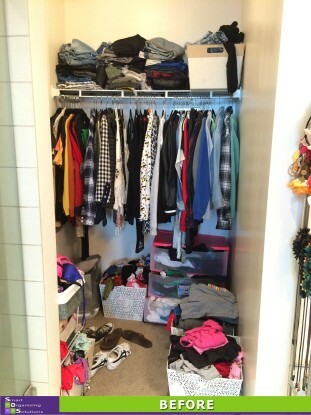 She couldn’t get to anything and she had piles of clothes sitting on the floor. So she decided it was time to turn this space into a full on dressing room. 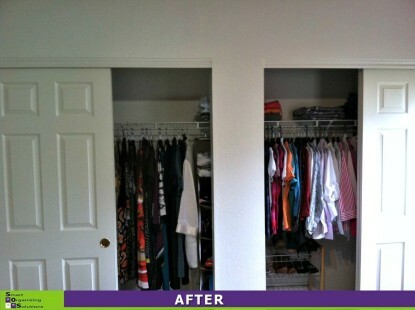 We pulled the doors off to make reaching both ends of the closet easier. And then we turned to Elfa from The Container Store. 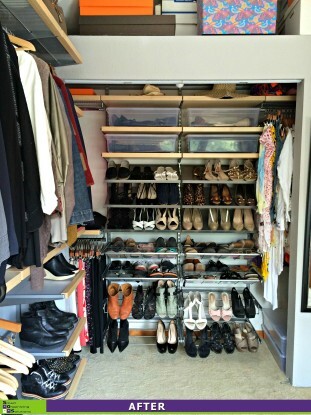 The reach-in became her showcase for shoes with hanging space on the side for little-worn items. 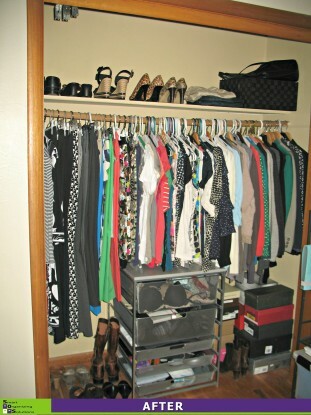 And we turned one wall into a beautiful display of the clothes she loves and wears most often. This closet was bulging at the seams. 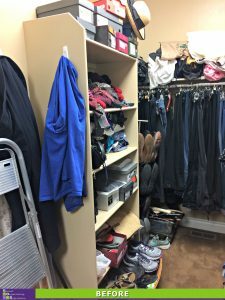 But in a matter of just a couple of hours we cleared out the shoes that pinched toes, the pants that didn’t fit quite right and clothes that were never going to be worn again. We then grouped all of the dresses together, moved all of the pants and skirts to the bottom row and kept all of the blazers and shirts up top. Now this happy SOS client can not only see everything she has, but actually get to it easily. Closets are one of my favorite spaces to organize. 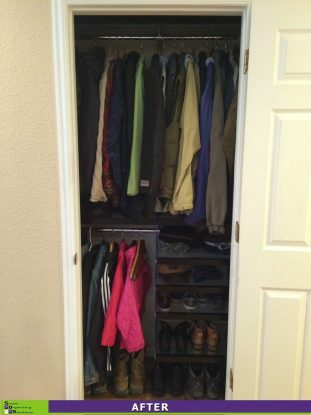 And this closet in Broomfield was no exception. Like many of my clients, this homeowner wanted to start from scratch and go with Elfa from The Container Store. They desperately needed shoe storage and drawers. After coming up with a design that maximized every inch of space, we had it installed and then got to the fun part of putting everything away. Quite a difference, don’t you think? 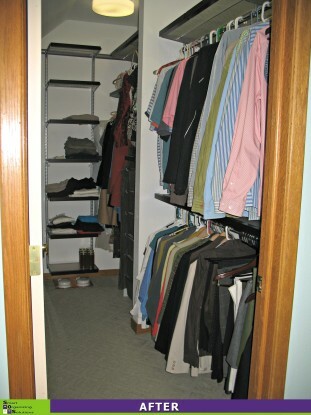 A Park Hill couple needed help maximizing their small closets. 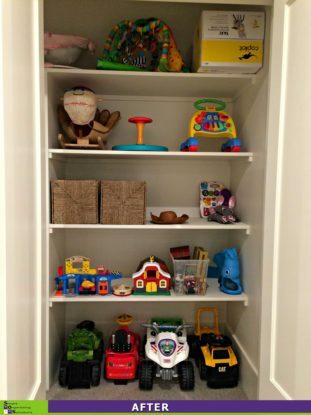 They already had Elfa in the master closet, but it wasn’t meeting their needs. 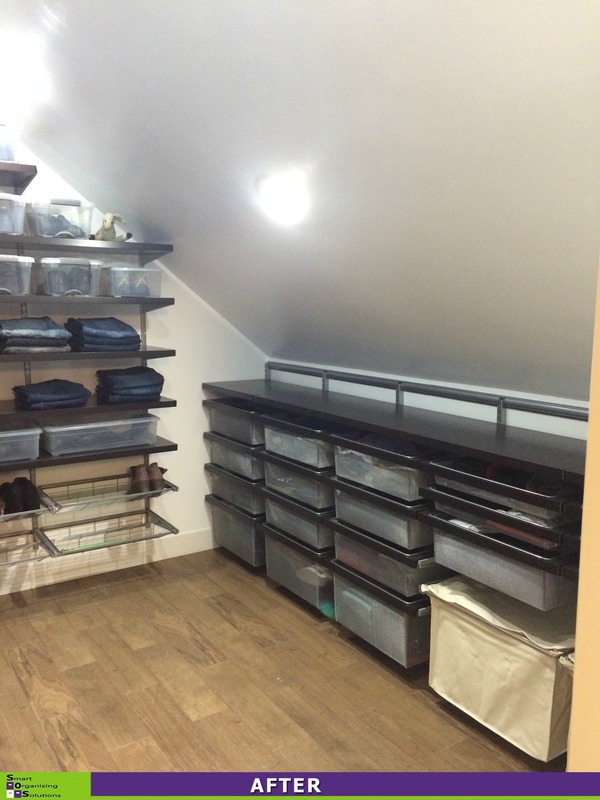 For that, we just re-configured the design to squeeze as much storage out of the space as possible. In addition, we worked together to purge the items they no longer wanted. We ended up with 8 big bags of donations! They also wanted to make their guest closet more inviting for visitors. We again turned to Elfa to make the most of this small space. The results speak for themselves. 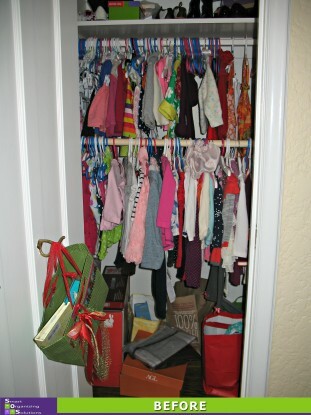 And then it was time for their daughter’s closet. As just a wee one, she is rapidly growing out of and into clothes. So we set up a system to make it easier for Mom and Dad to get her ready in the morning and plan for upcoming seasons. 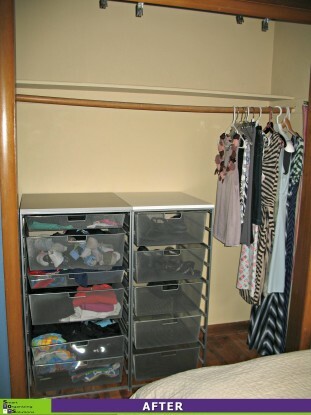 We also made better use of the shelves above her hanging clothes and added a small drawer unit at the bottom. When this Lakewood couple moved into their new home, they knew they needed a closet makeover. They had a very strange free standing shelving unit with about 2 feet of hanging space. 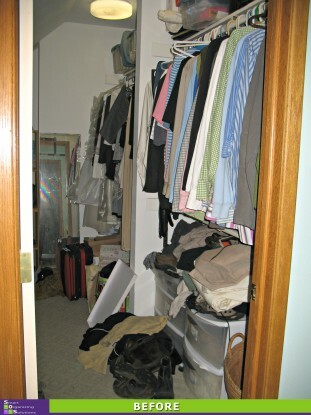 Not only that, most of their closet is actually behind the wing walls, making it very tough to access clothes. 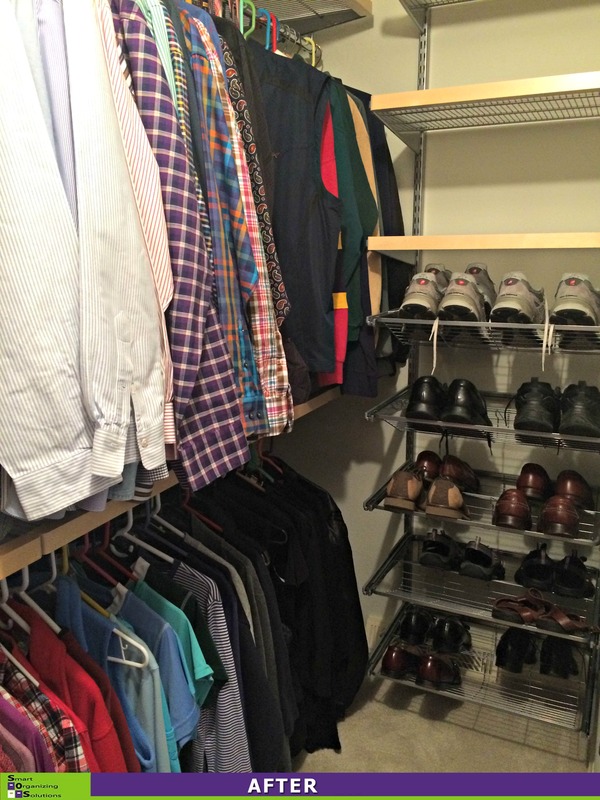 So we came up with a way to maximize the entire closet…even the hard-to-reach areas. 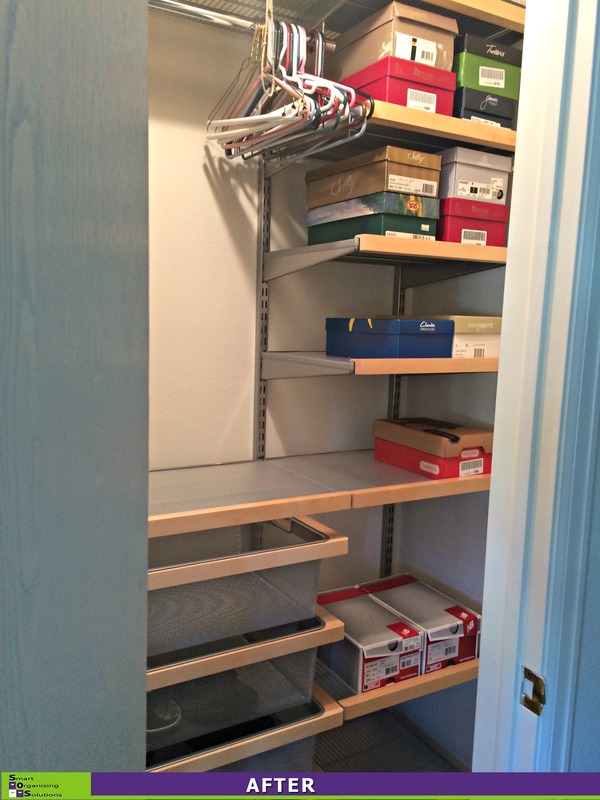 In addition to building in some double hanging space, we were able to add in shoe storage and a couple of drawers. And the space behind the walls? 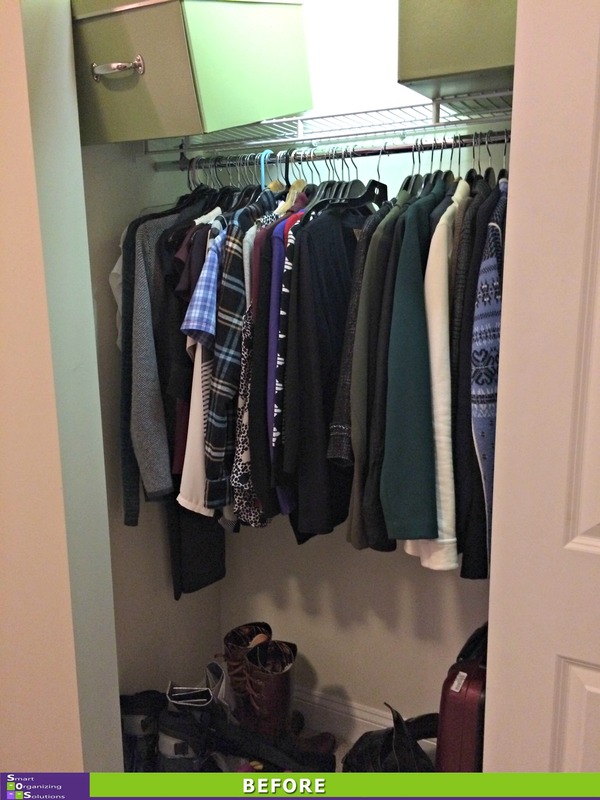 Perfect for out-of-season clothes! 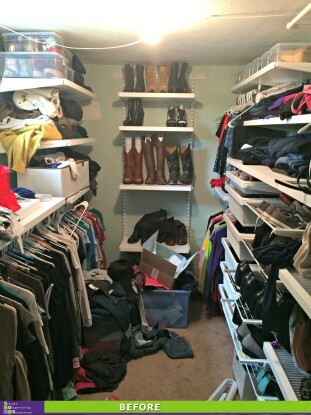 This Englewood homeowner was using 3 closets to get ready each morning. Yes, 3! 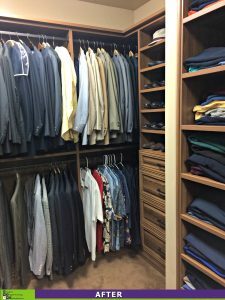 Granted, they are fairly small closets, but as you can imagine, it made getting dressed for work both chaotic and frustrating. The first step was to take everything out. 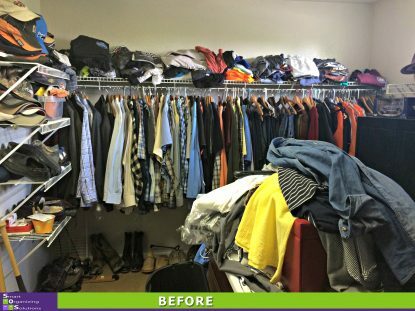 We did a quick sort of clothes to keep, donate or throw away. 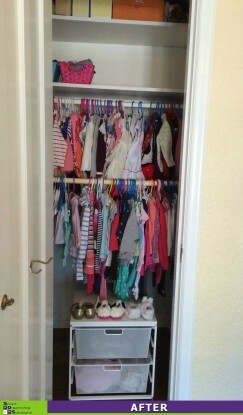 We decided to use one closet for all of her work clothes and another closet for play clothes and workout gear. 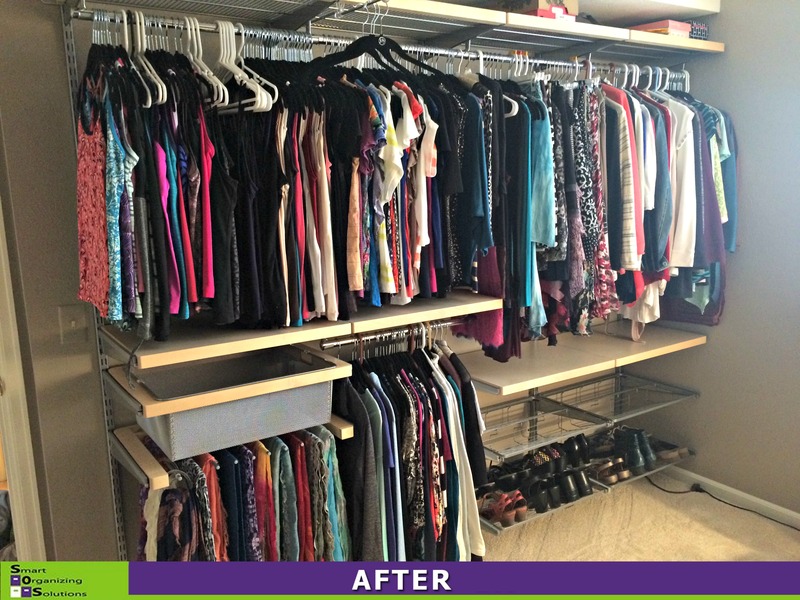 We further organized the work closet into slacks, dresses, cardigans and blouses. 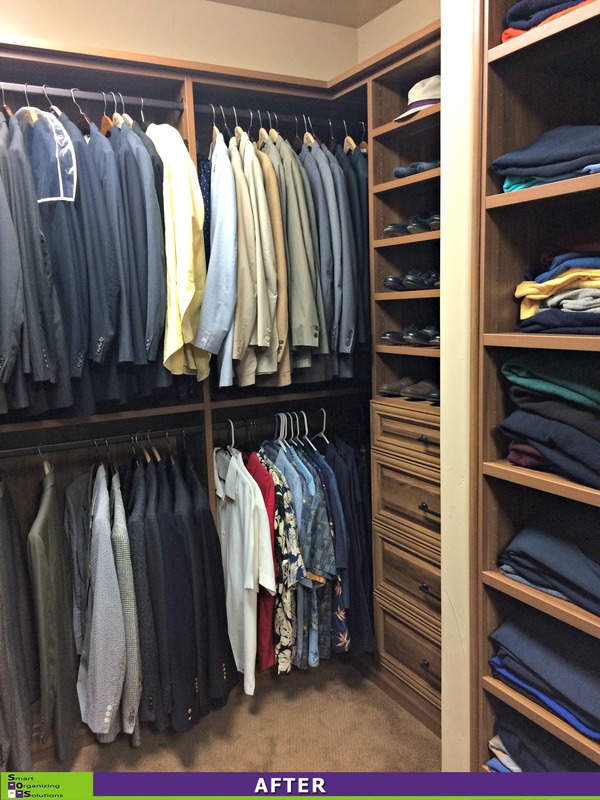 Now getting ready is a snap…and there’s even room for her hubby’s clothes in one of the closets. 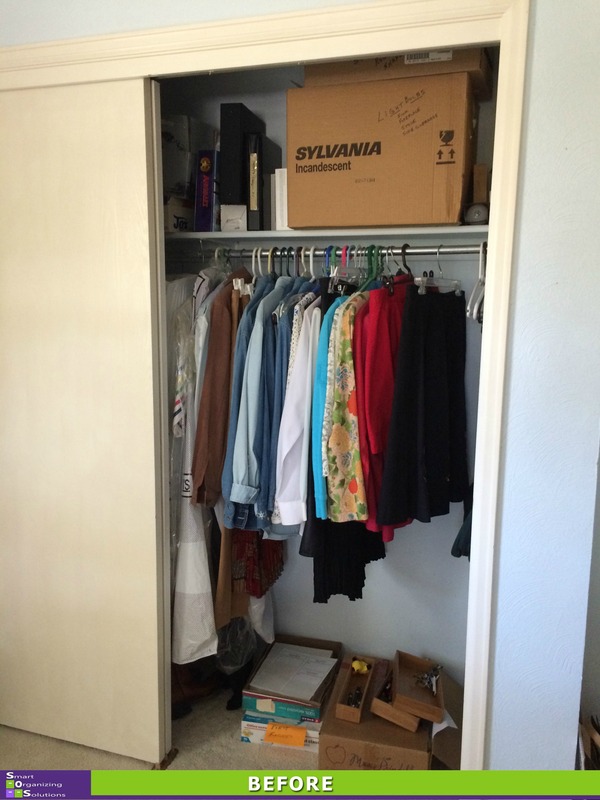 These Stapleton homeowners needed help with their tiny hallway coat closet. It’s all about layers in Colorado so even two people accumulate a lot of coats. 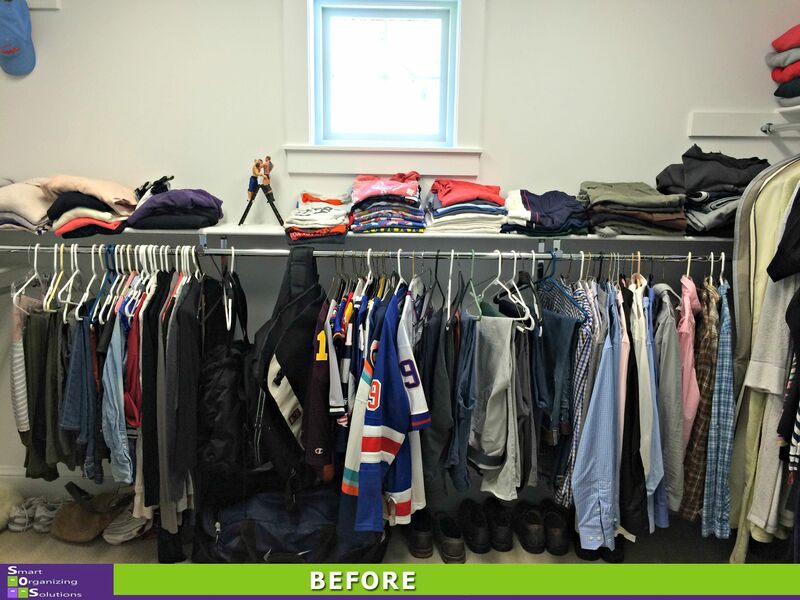 Because this couple actually wears everything in the closet, we decided on a smart solution using a hanging Space Bag. We were able fit 6 heavy coats in the bag and shrink them down to the size of just one! 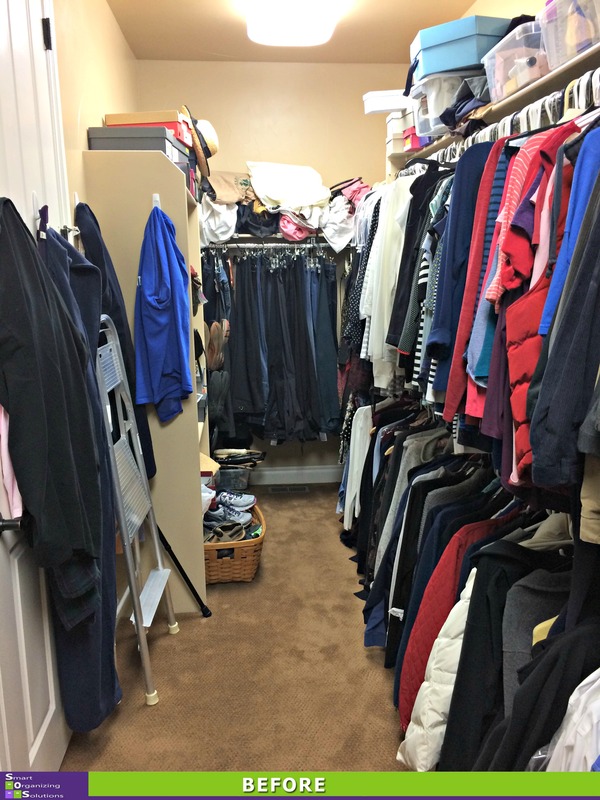 For gloves, scarves and hats, we chose a couple of bins — one for her and one for him. 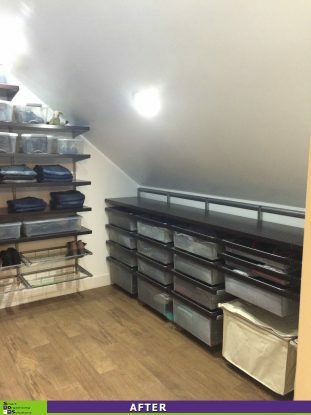 That left space on the top shelf for re-usable bags and freed up floor space so boots were easier to access. 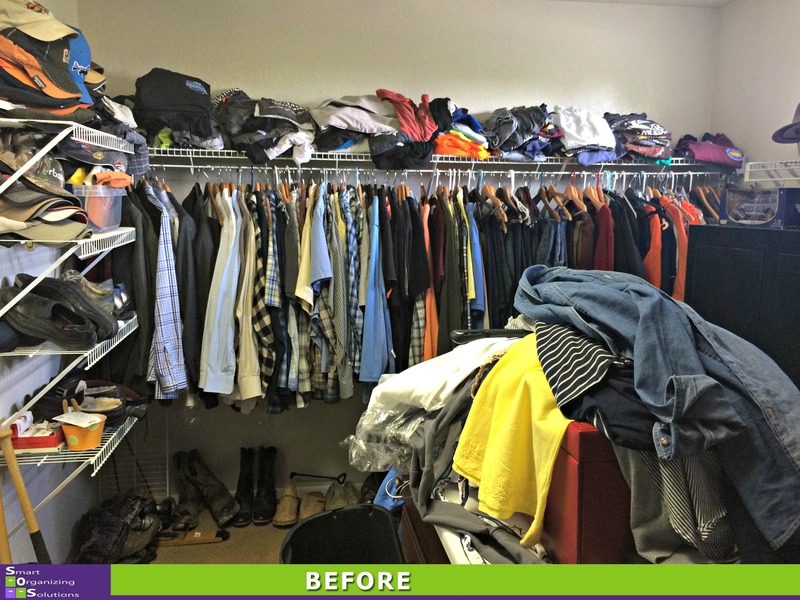 These Park Hill homeowners were ready for a complete closet makeover. The space was being used for clothes, shoes galore, luggage, wrapping paper, holiday decorations and a hidey hole for gifts. 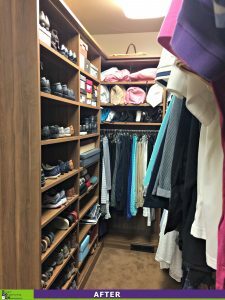 The first step was to empty the closet to make way for the new and improved design which includes a combination of short and long hang, drawers, shoe shelves and shelves for storing luggage and the various other items they wanted to keep in this space. 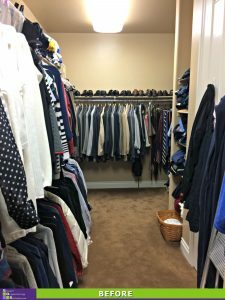 After editing the items to be returned to the closet, the end result is a less cluttered space and a very happy husband and wife. 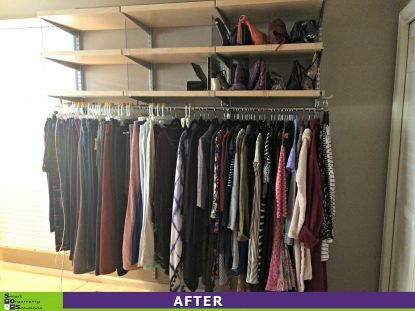 When this homeowner moved to Aurora, she went from a spacious walk-in closet with plenty of shelves and hanging space to a much smaller reach-in closet. 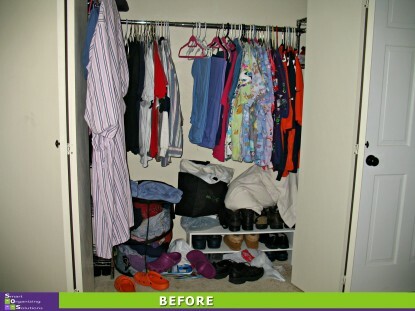 All it took to overcome this closet hang-up was a simple switch in thinking about how to organize her clothes and shoes for easy access.